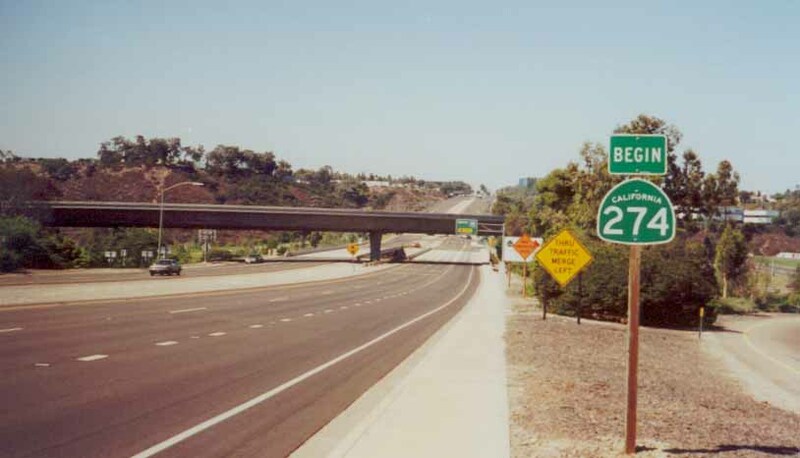 Former California 274 was Balboa Avenue, entirely within the City of San Diego, between Interstate 5 and Interstate 15 through Pacific Beach, Clairemont Mesa, and Kearny Mesa. It was decommissioned in May 2001. 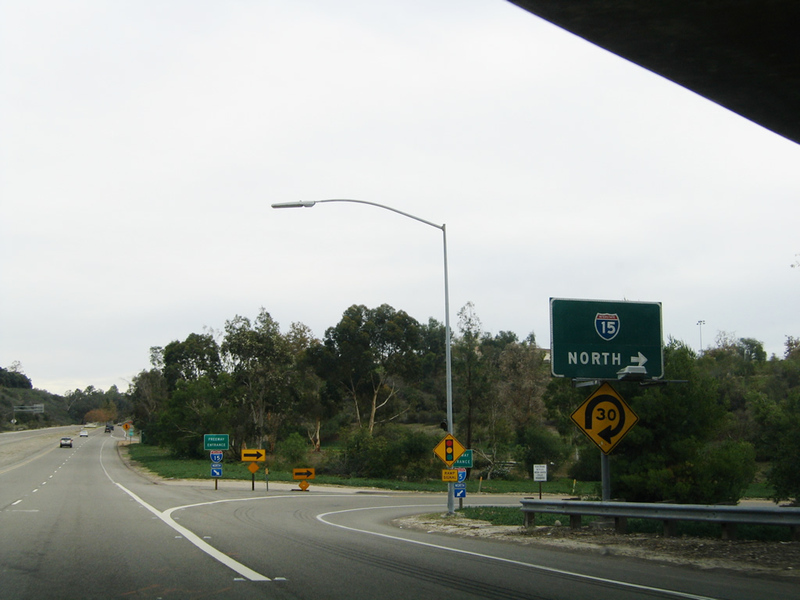 As of August 2003, California 274 remained as a signed route, but only a few signs on intersecting freeway routes remained by June 2007. Straggler shields were eventually removed. Around 1971. California 274 commissioned. February 24, 1998. Parts of the California 274, Interstate 15, and Murphy Canyon Road interchange complex swallowed by an El Ni-o sinkhole. This sinkhole, which was centered near the ramp from eastbound California 274 to southbound Interstate 15, measured 550 feet long. In addition to highway damage, underground utilities were also ruined. A clogged storm drain during a heavy rainstorm caused the sinkhole. Rushing water from the storm drain undermined the soil beneath the entrance ramp. May 5, 1998. Balboa Avenue reopened for the first time since February floods, allowing Tierrasanta residents direct access to the Kearny Mesa area. May 30, 1998. Interchange between Interstate 15 and California 274 reopened. August 22, 1998. Final utility and interchange repair work completed. Murphy Canyon Road reopened for first time since February, to the delight of San Diego Chargers officials (the practice field for the Chargers lies just south of the interchange). 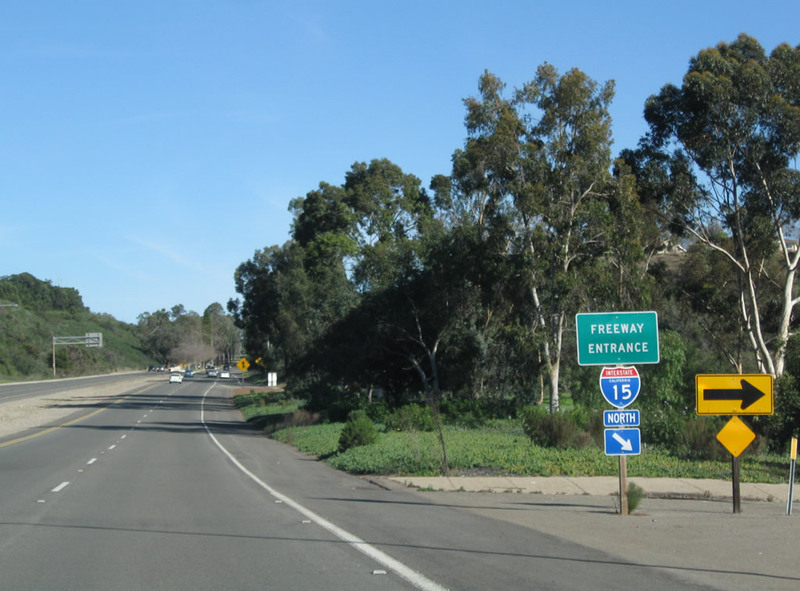 Caltrans announces plans for over $600,000 in landscaping for the interchange and surrounding area. Summer 1999. 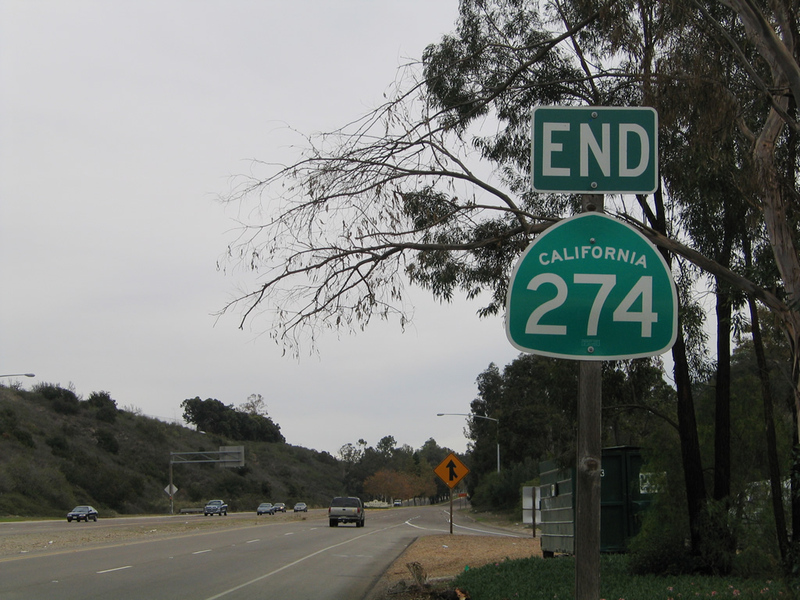 California 274 decommissioned in the state legislative books, but route remains signed. May 2001. The San Diego City Council votes to accept California 274 (and California 209) into the city&apos;s street inventory, thus ending California 274 as a state route. However, signs still remained as of October 2002 but were largely gone by 2006. 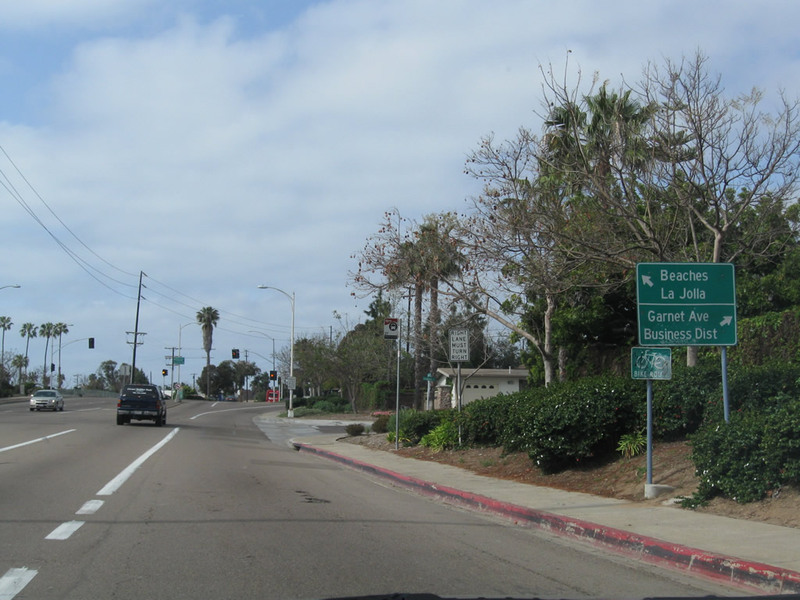 In the community of Pacific Beach within the city of San Diego, Garnet Avenue travels east toward its intersection with Historic U.S. 101 and Mission Bay Drive (old Business Loop I-5). 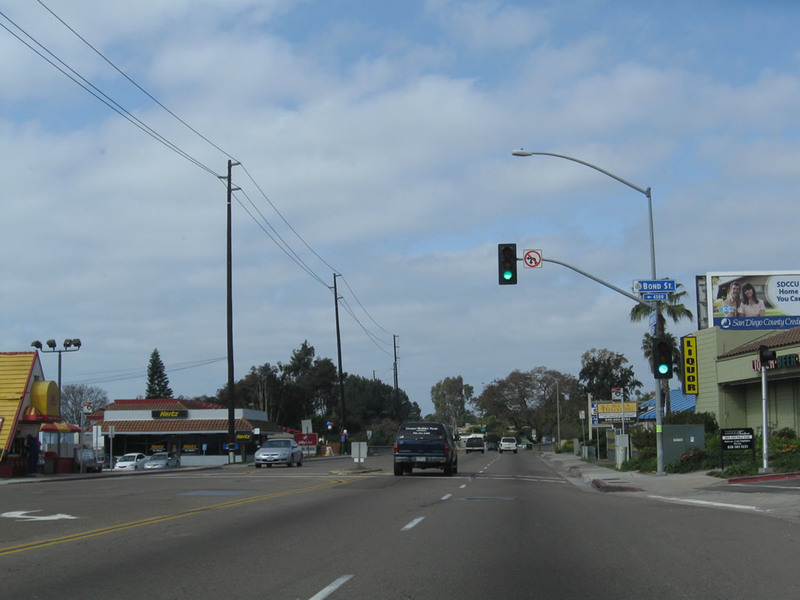 This guide sign (which was replaced around 2006) indicated that traffic bound for the Clairemont community should continue east along Balboa Avenue. 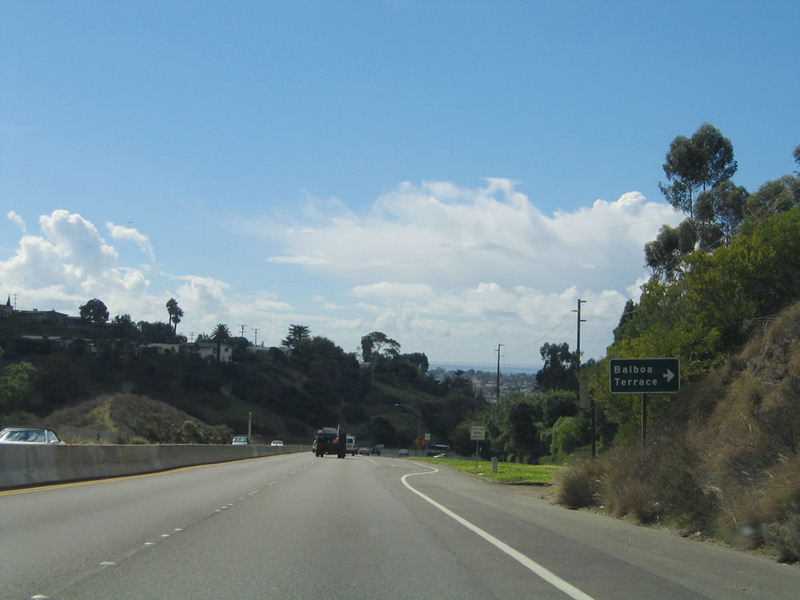 Turn left here for Interstate 5 north to La Jolla, Carmel Valley, Oceanside, Los Angeles, and points north. 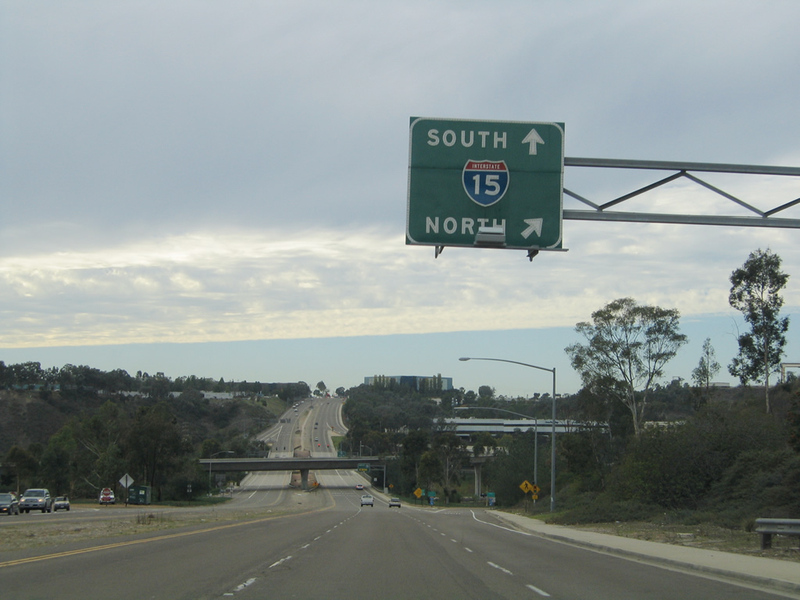 Turn right to follow Interstate 5 south to downtown, Chula Vista, and the international border with Mexico. Photos taken 10/24/09 and 10/28/04. 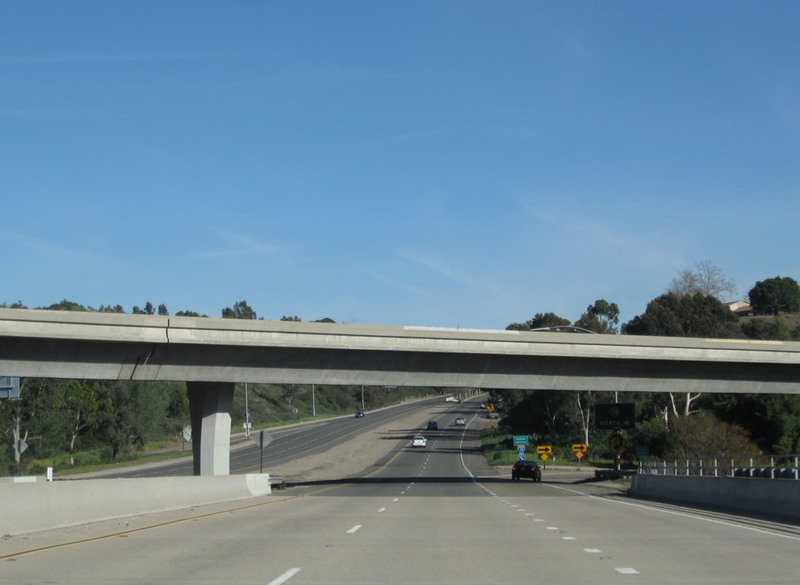 After the Mission Bay Drive intersection, Balboa Avenue (old California 274) will pass under Interstate 5. Photo taken 11/05/04. Balboa Avenue (old California 274) passes under a massive bridge that carries Interstate 5 over the top of Balboa Avenue. Photo taken 10/25/09. 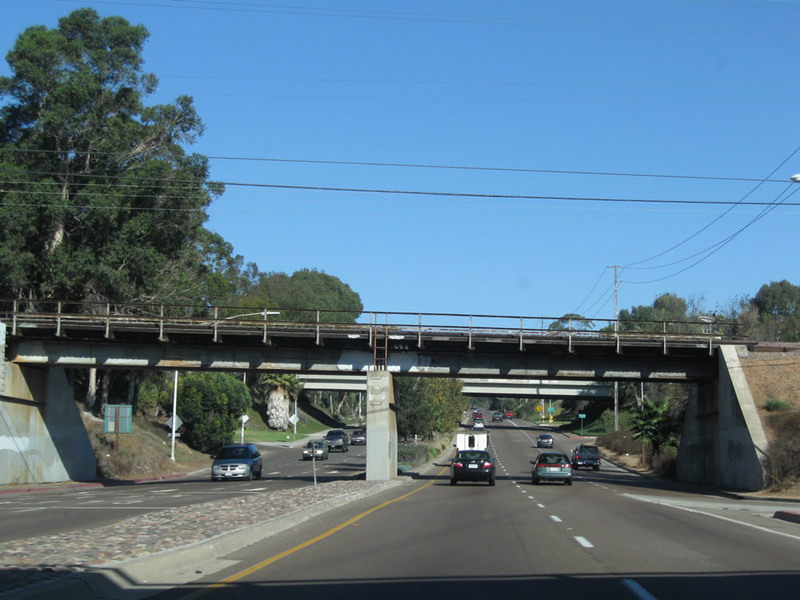 As traffic from northbound Interstate 5 merges onto eastbound Balboa Avenue on the right, Balboa Avenue passes under the railroad. Photo taken 10/25/09. Soon thereafter, eastbound Balboa Avenue approaches an interchange with Morena Boulevard. Use Morena Boulevard north to the Bay Ho neighborhood and south to the Bay Park neighborhood. Photo taken 10/28/04. 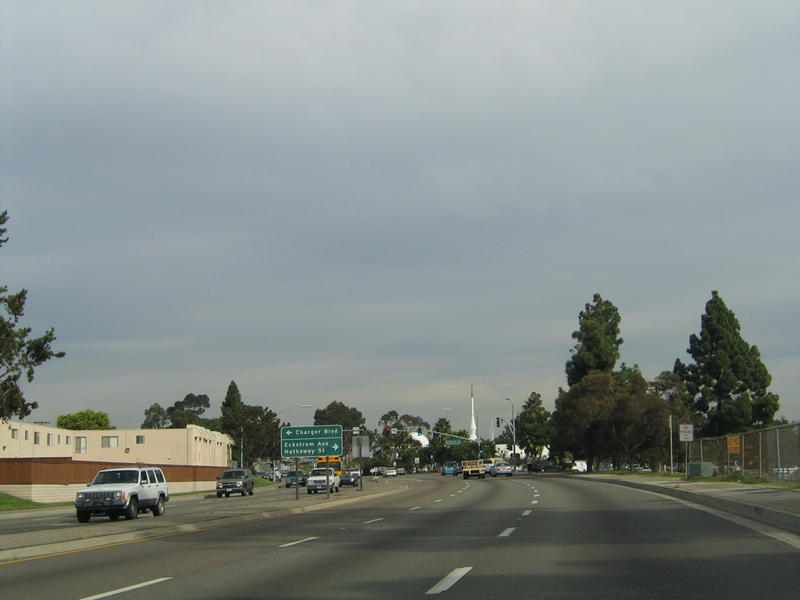 Eastbound Balboa Avenue (old California 274) meets the ramp to southbound Morena Boulevard. The second right turn connects to Morena Boulevard north. Photo taken 10/28/04. 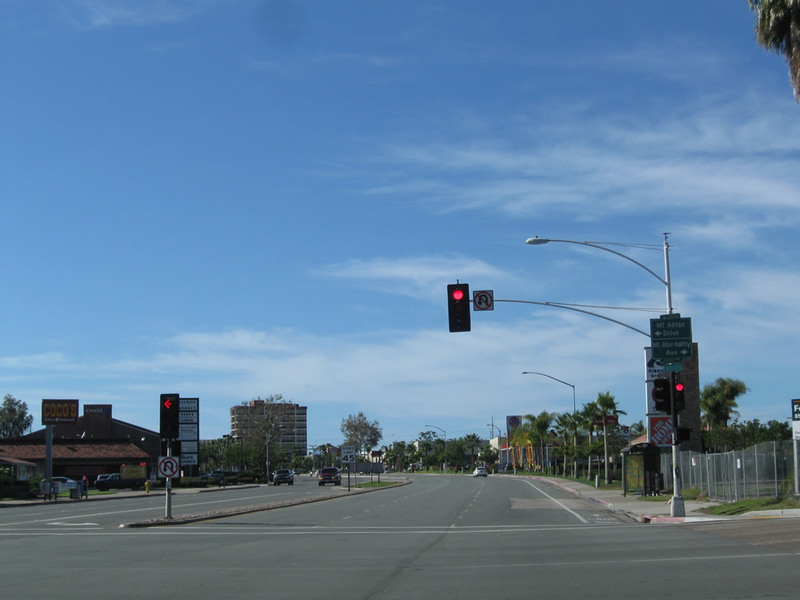 The next traffic signal along eastbound Balboa Avenue is with Moraga Avenue. Photo taken 10/28/04. 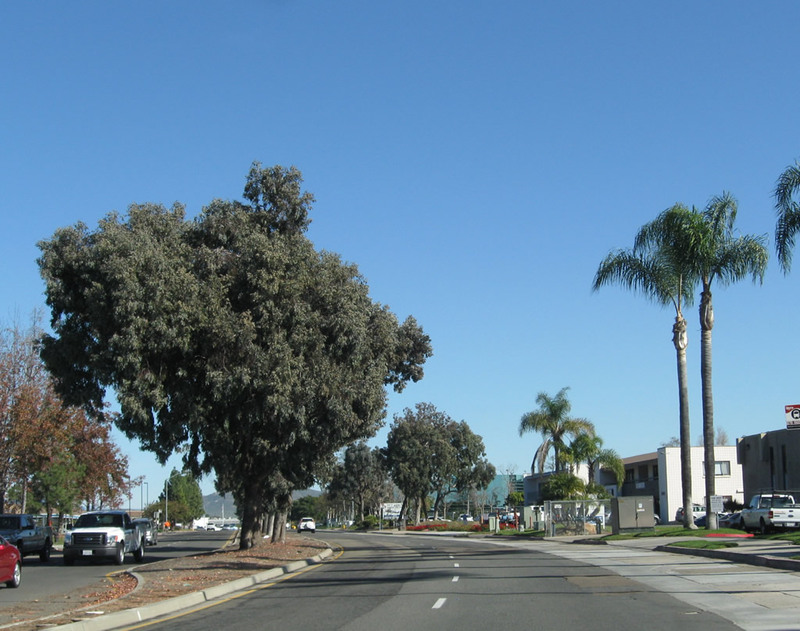 Balboa Avenue enters the community of Clairemont. Photo taken 10/25/09. 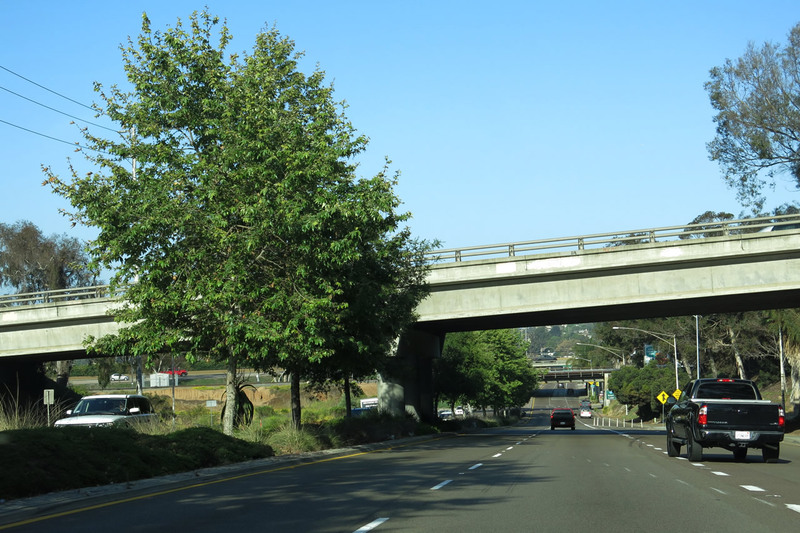 The first California 274 east reassurance shield used to be posted on eastbound Balboa Avenue prior to the Moraga Avenue intersection; it is now gone. Photo taken 11/05/04. 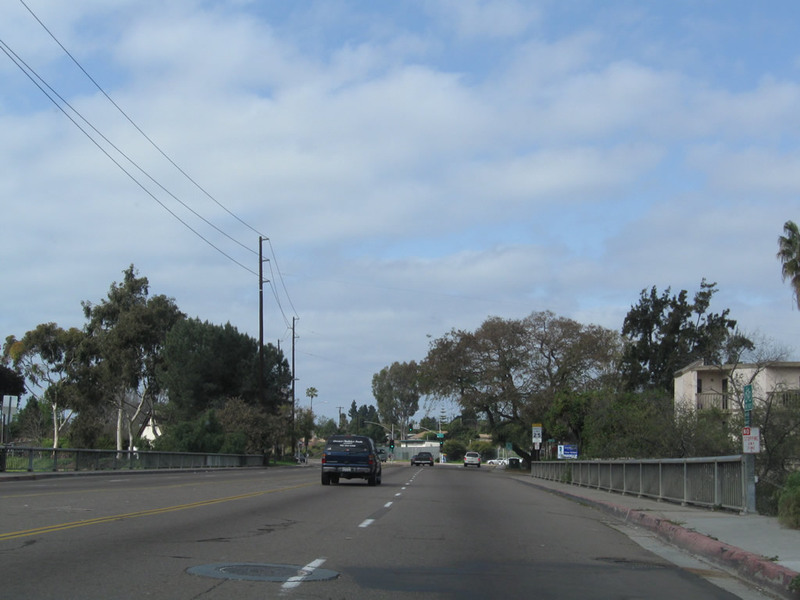 Eastbound Balboa Avenue (old California 274) approaches Clairemont Drive. 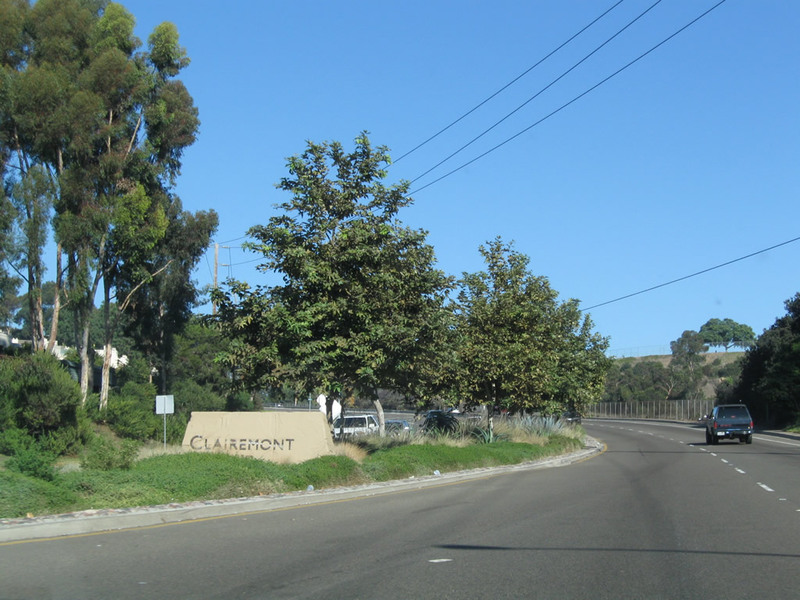 Turn left (north) to the Clairemont Town Center and right to return to Interstate 5 via Bay Park. Photos taken 10/25/09 and 11/05/04. 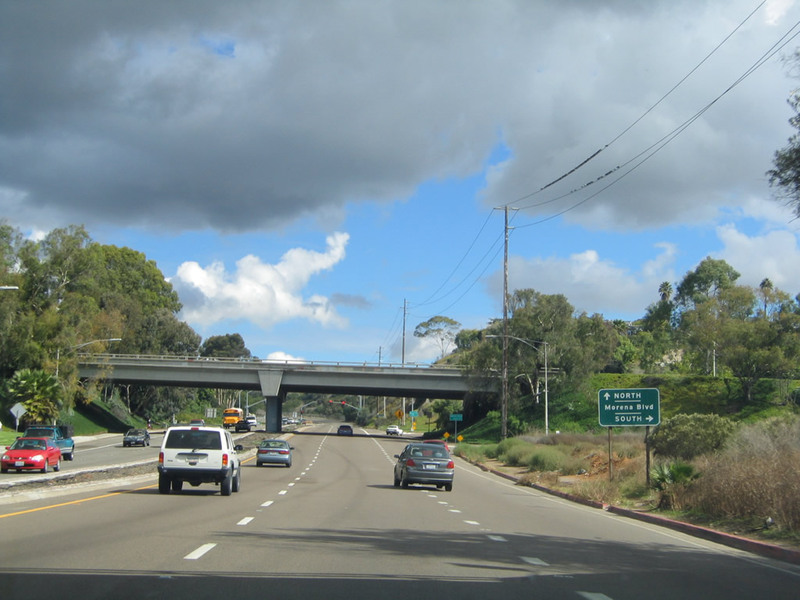 Through Tecolote Canyon, Balboa Avenue (old California 274) assumes the appearance of an expressway between Clairemont Drive and Genesee Avenue. This portion of Balboa Avenue is undeveloped, as this canyon is dedicated open space/parkland. Photo taken 11/05/04. 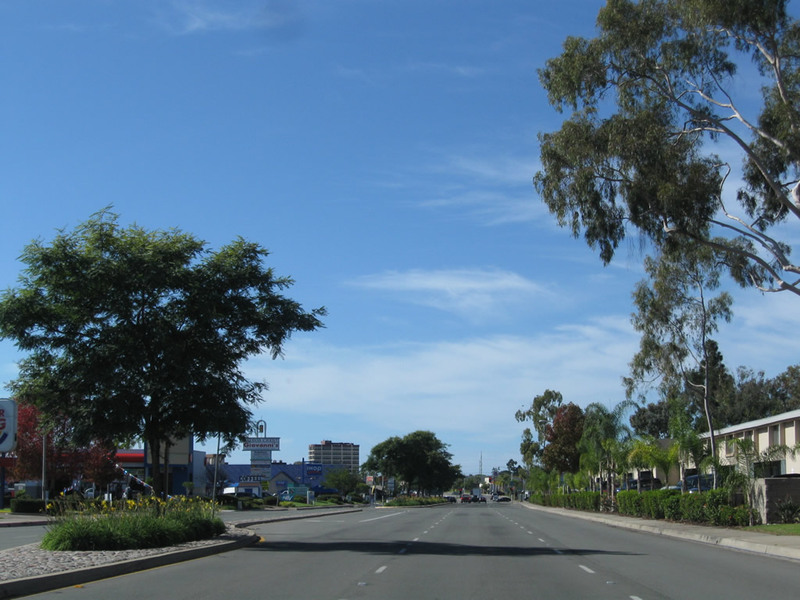 This former state route was repaved in 1999, prior to the relinquishment of Balboa Avenue to the city. 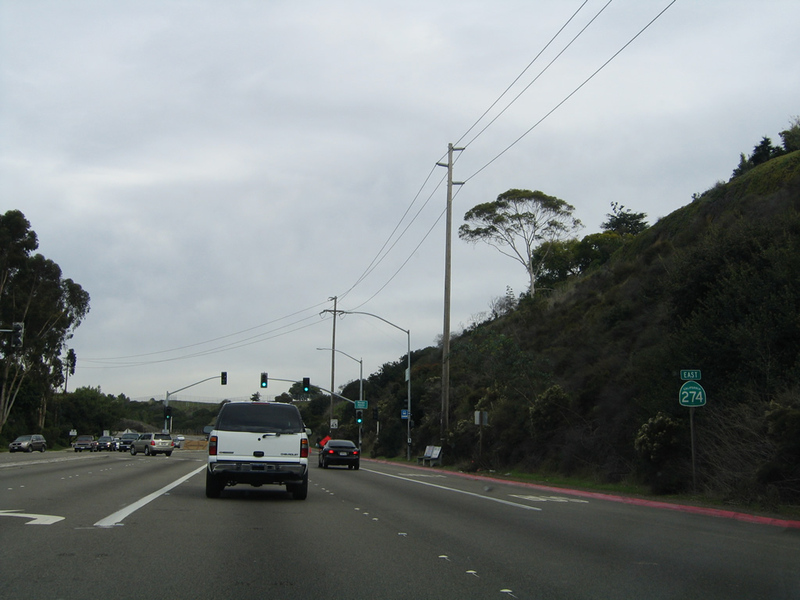 Most streets maintained by the City of San Diego do not use raised pavement markers (Botts Dots) to delineate lanes. 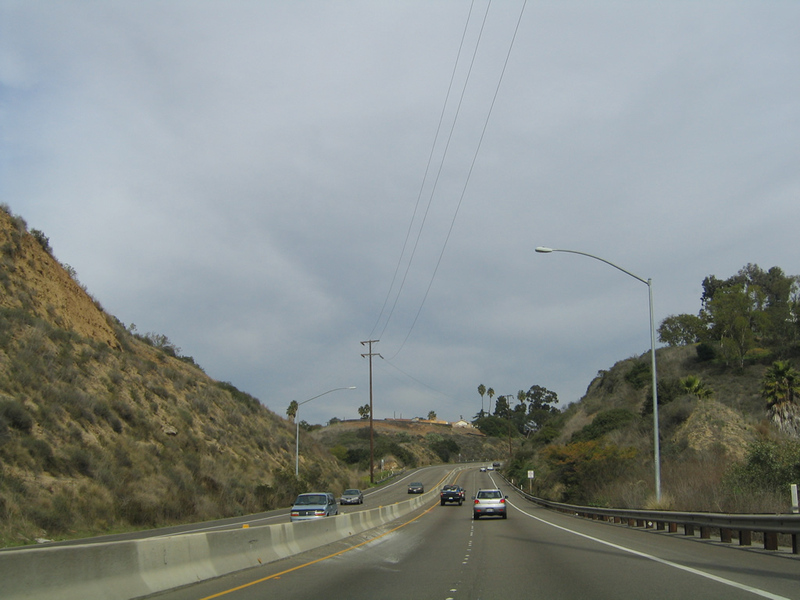 The use of Botts Dots on this expressway segment of Balboa Avenue through Tecolote Canyon clearly shows that the road was built to Caltrans rather than City standards. Photo taken 11/05/04. 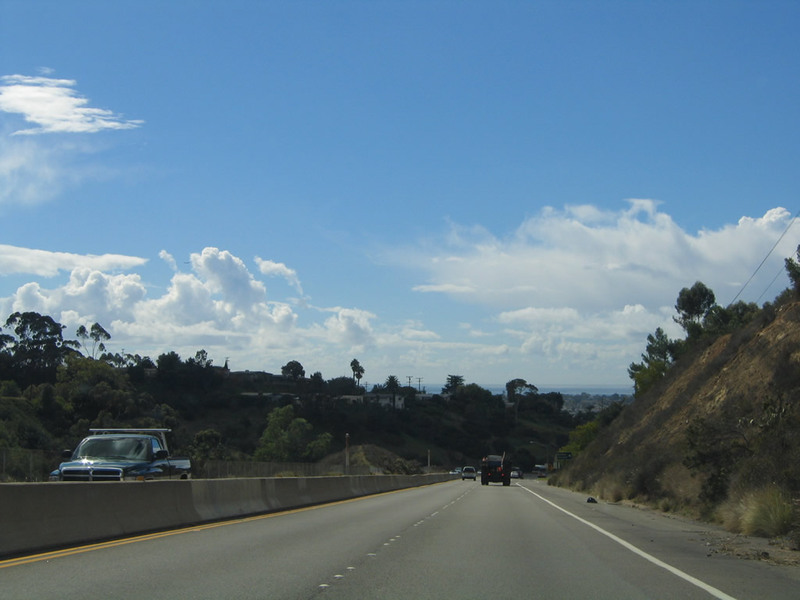 Tecolote Canyon Natural Park is a finger canyon located within the Clairemont community of the city of San Diego. 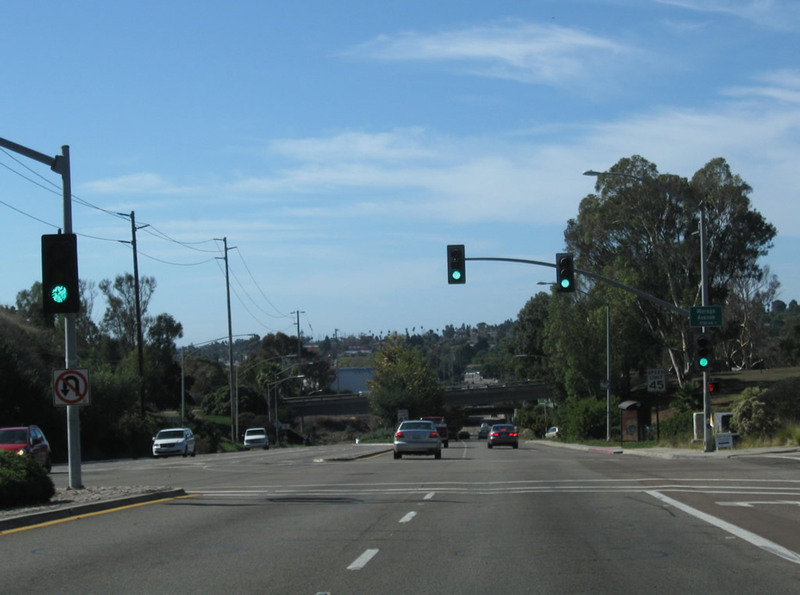 Balboa Avenue passes through the northern end of the canyon and will soon ascend back to Clairemont Mesa. Photo taken 11/05/04. 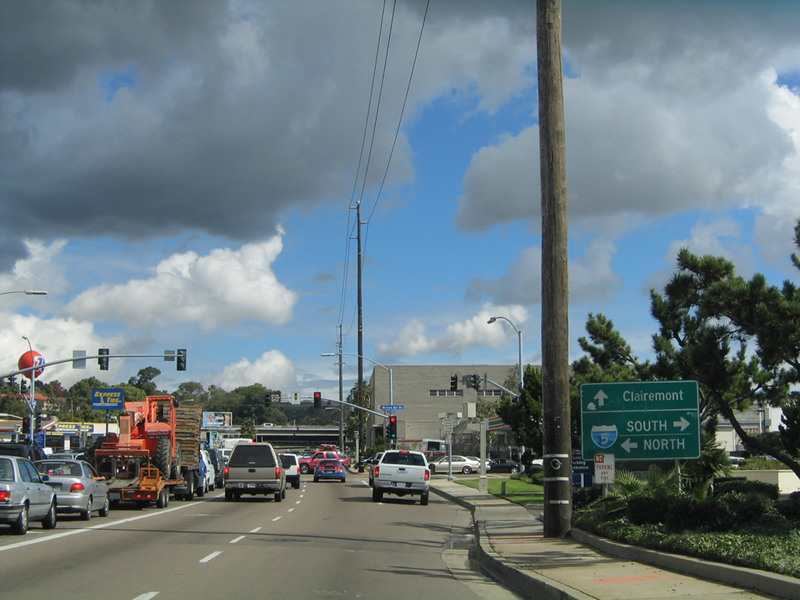 Reentering a commercial and residential area, eastbound Balboa Avenue (old California 274) approaches Mount Everest Boulevard. Photo taken 11/05/04. 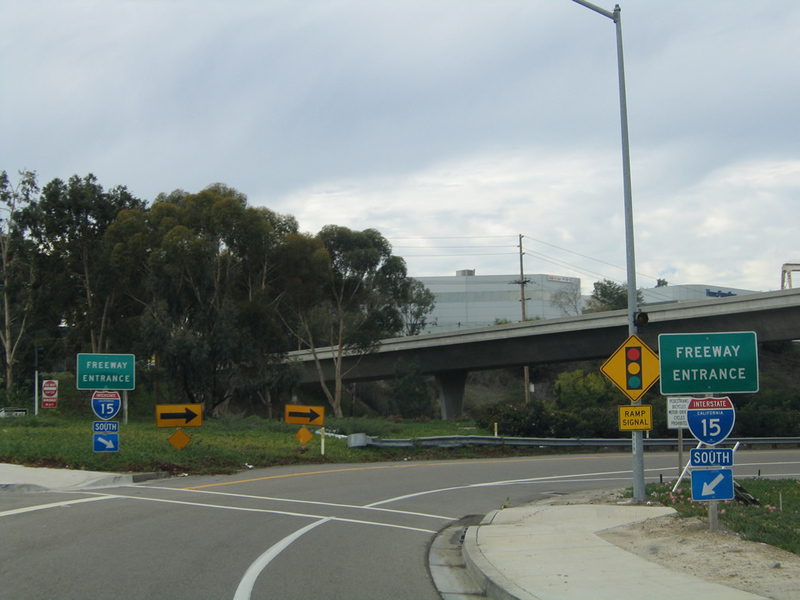 A California 274 east reassurance shield was previously posted on Balboa Avenue prior to Mount Everest Boulevard, but that shield was removed in 2005. Photo taken 11/05/04. Now at the Genesee Avenue intersection, a California 274 trailblazer (without the state name) was posted on the traffic signal mast arm. This shield is also now gone. Photo taken 11/05/04. 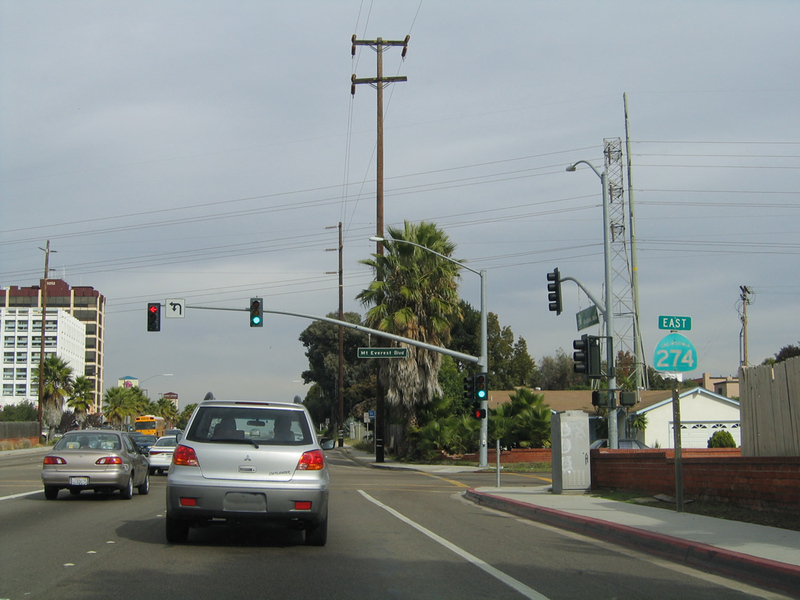 East of Genesee Avenue, Balboa Avenue (old California 274) widens to three eastbound lanes with additional auxiliary lanes for turning. This section of Balboa Avenue can be extremely busy, especially during commuting hours. The traffic signal ahead serves a connection to Mount Alifan Drive south and Mount Abernathy Drive north. Photo taken 11/05/04. 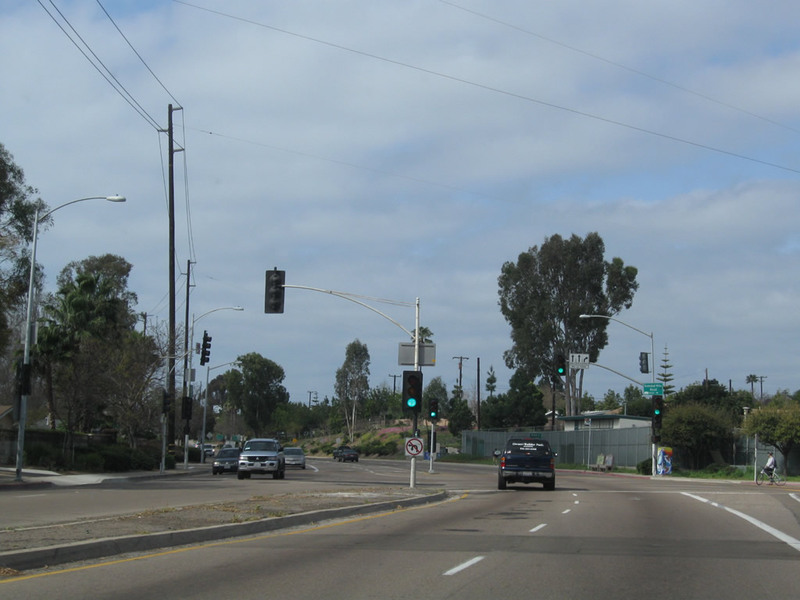 The next traffic signal along eastbound Balboa Avenue (old California 274) is with Cannington Drive north and Mount Albertine Avenue south. Photo taken 11/05/04. Eastbound Balboa Avenue (old California 274) approaches Charger Boulevard north, Eckstrom Avenue east, and Hathaway Street south. The context of this sign changed dramatically with the installation of a new landscaped median. By 2012, trees were abundant in the center of the street. Photos taken 08/18/12 and 11/05/04. 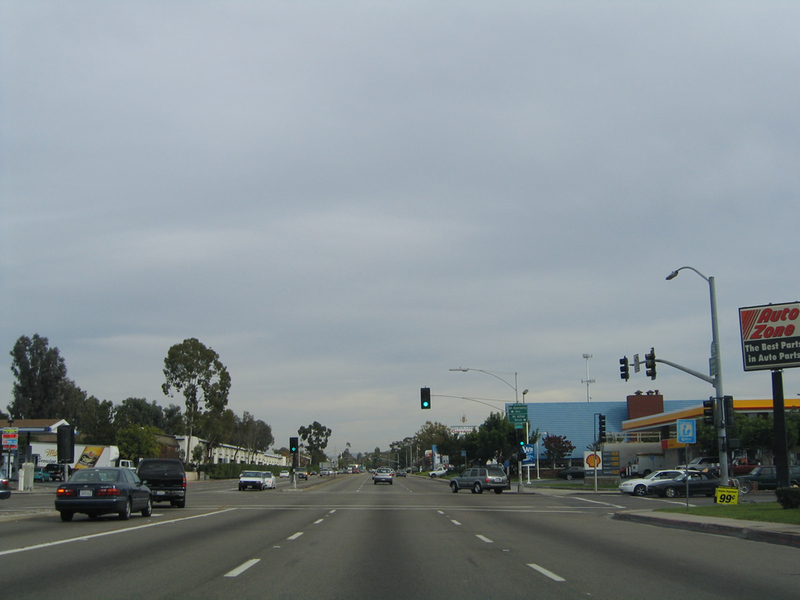 A short distance later, Balboa Avenue (old California 274) east meets Interstate 805 (Dekema Freeway). 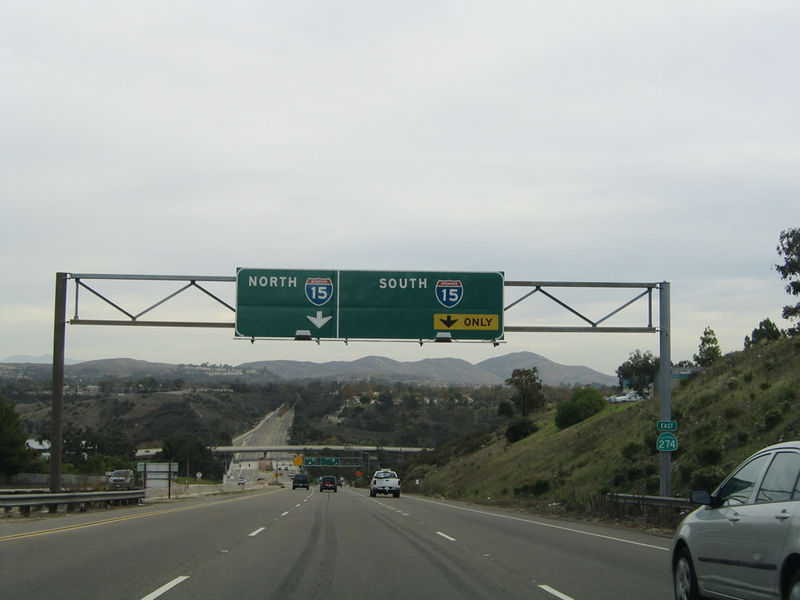 The first ramp connects to Interstate 805 south to Mission Valley, North Park, National City, Chula Vista, and the International Border at San Ysidro. Photo taken 11/05/04. 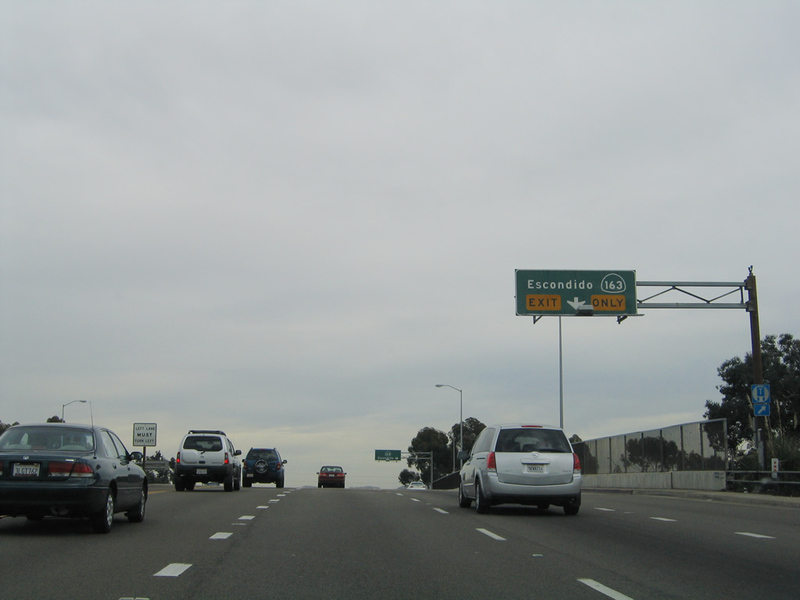 Eastbound Balboa Avenue (old California 274) meets Interstate 805 north (a loop ramp/right exit). 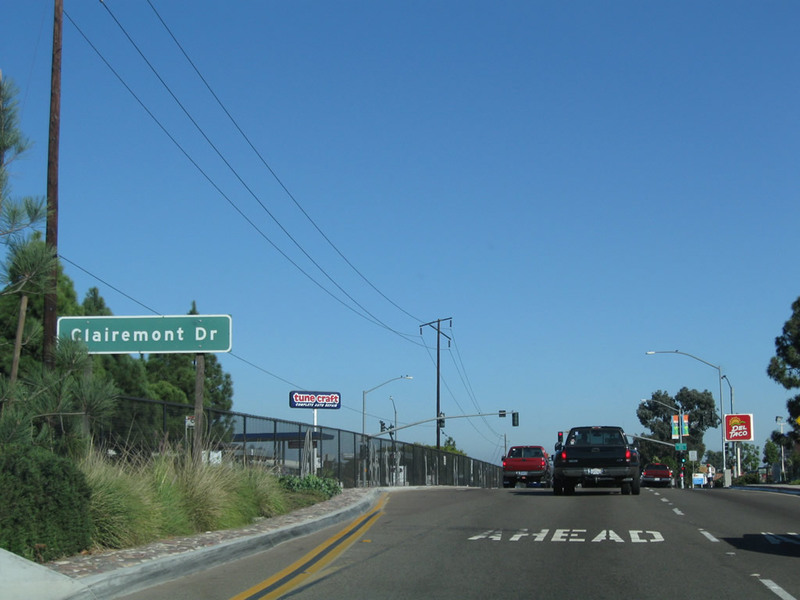 Still in the city limits of San Diego, eastbound Balboa Avenue leaves the community of Clairemont and enters the community of Kearny Mesa. Photos taken 08/08/12 and 11/05/04. After Ruffner Street, the next major intersection along eastbound Balboa Avenue (old California 274) is with Convoy Street. Photo taken 11/05/04. Continuing east, Balboa Avenue (old California 274) approaches the turn off for Mercury Street south to California 163 (Cabrillo Freeway) south to Downtown. Photo taken 11/05/04. Eastbound Balboa Avenue (old California 274) approaches Mercury Street. 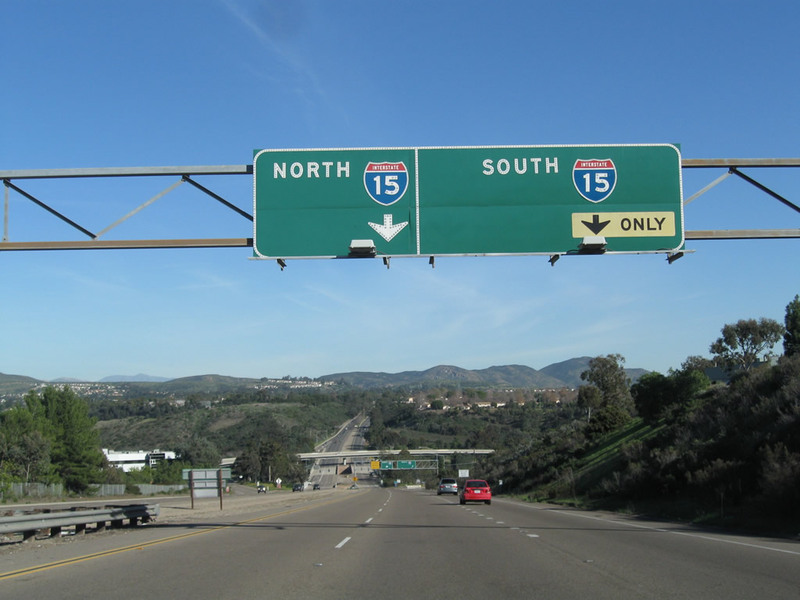 Turn right here to California 163 south; continue straight along Balboa Avenue to California 163 north (stay right). Photo taken 11/05/04. 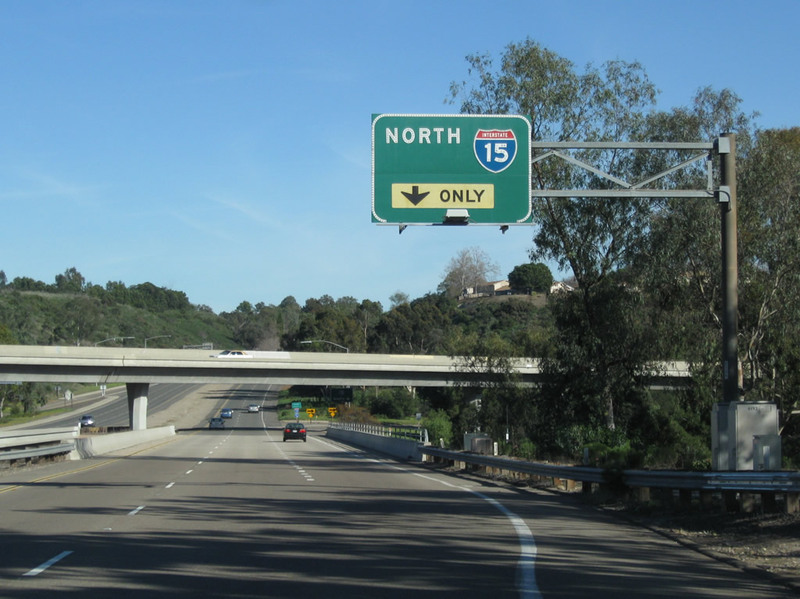 Now crossing California 163, the right lane of Balboa Avenue east becomes exit only for the loop ramp to California 163 (Cabrillo Freeway) north. The left lane becomes a turn lane to Kearny Villa Road northeast. Photo taken 11/05/04. 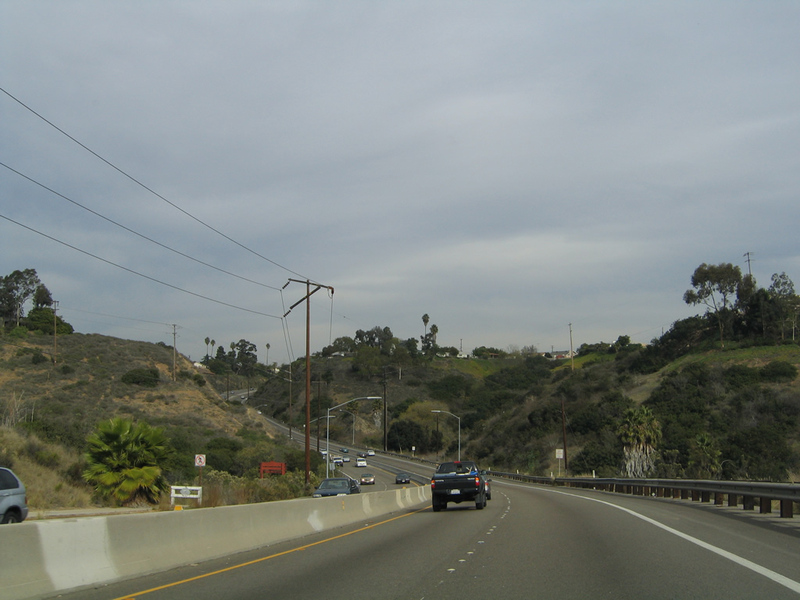 Eastbound Balboa Avenue (old California 274) meets California 163 (Cabrillo Freeway) north via this loop ramp. The next traffic signal ahead is with Kearny Villa Road. Photo taken 11/05/04. 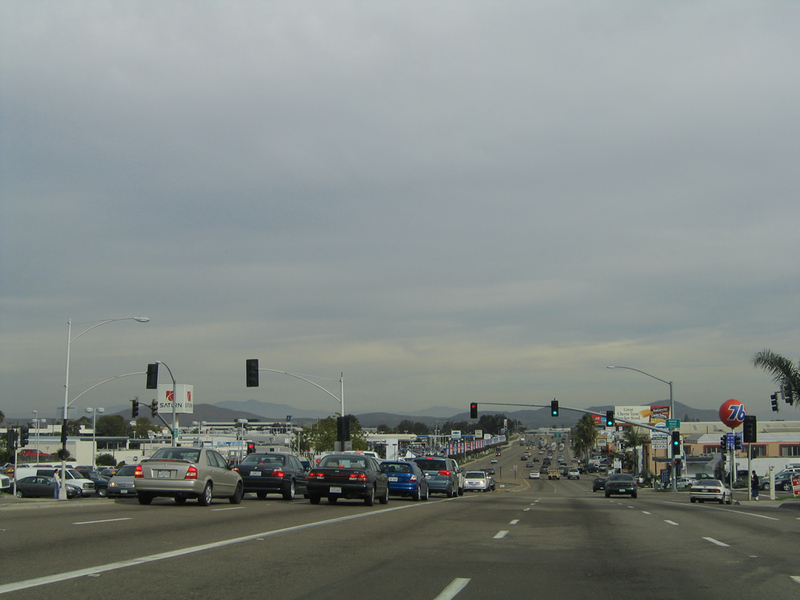 Shortly thereafter, eastbound Balboa Avenue (old California 274) meets Kearny Villa Road. The California 274 shield has been removed since this picture was taken. Photo taken 11/05/04. 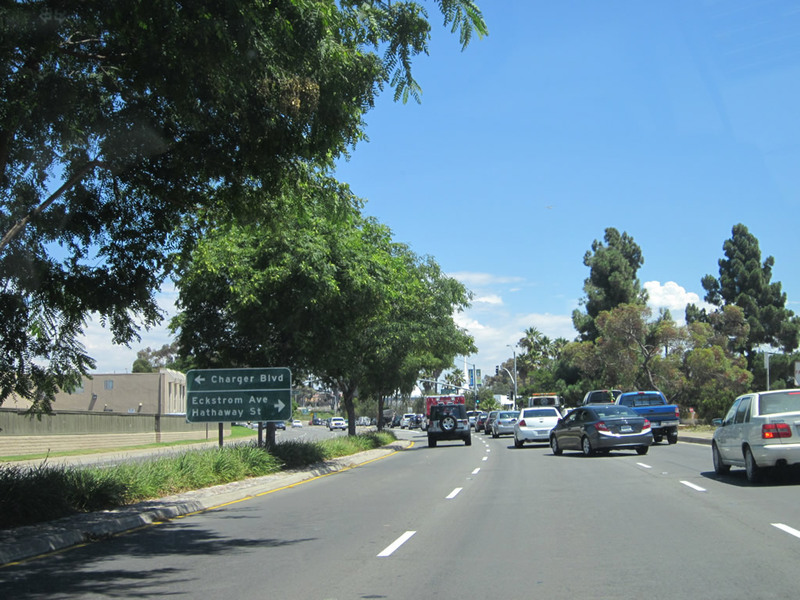 A wide, landscaped median follows Balboa Avenue (old California 274) east between Kearny Villa Road and Pennisi Driveway. Photo taken 01/14/11. 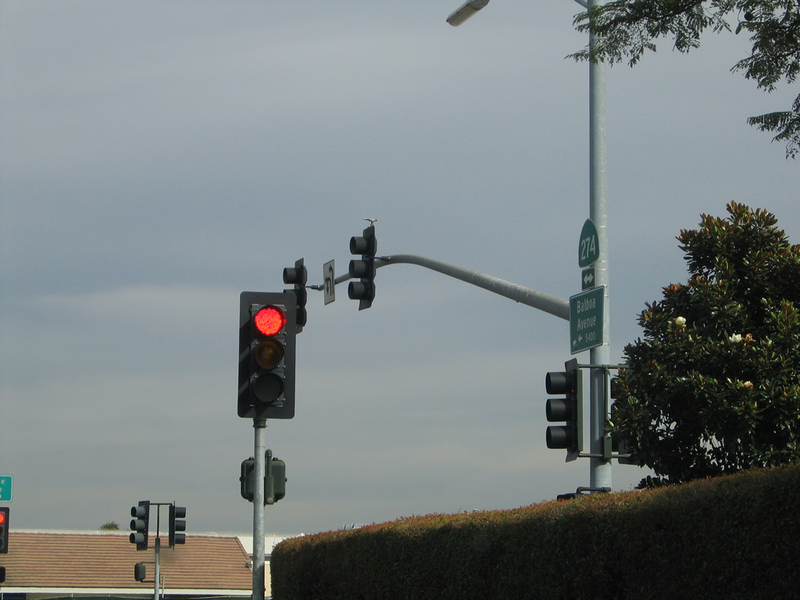 This traffic signal is located at the Pennisi Driveway along eastbound Balboa Avenue. 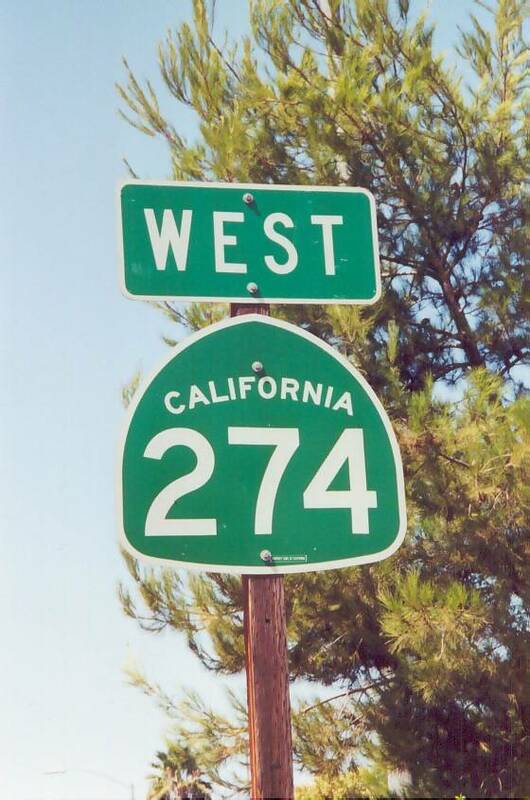 The California 274 shield here has since been removed. Photo taken 11/05/04. Continuing east, Balboa Avenue (old California 274) approaches Viewridge Avenue. Photo taken 11/05/04. Eastbound Balboa Avenue (old California 274) meets Viewridge Avenue. Photo taken 11/05/04. 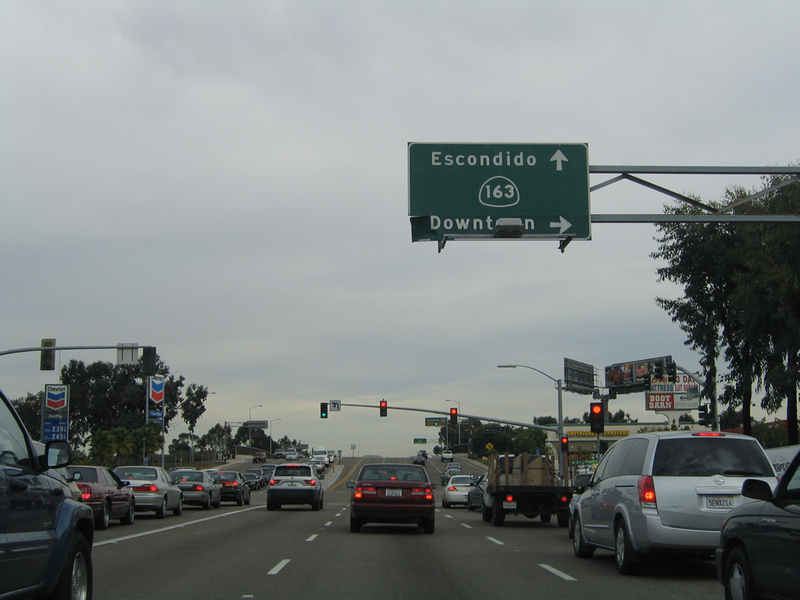 After Viewridge Avenue, eastbound Balboa Avenue approaches Interstate 15 (Escondido Freeway). 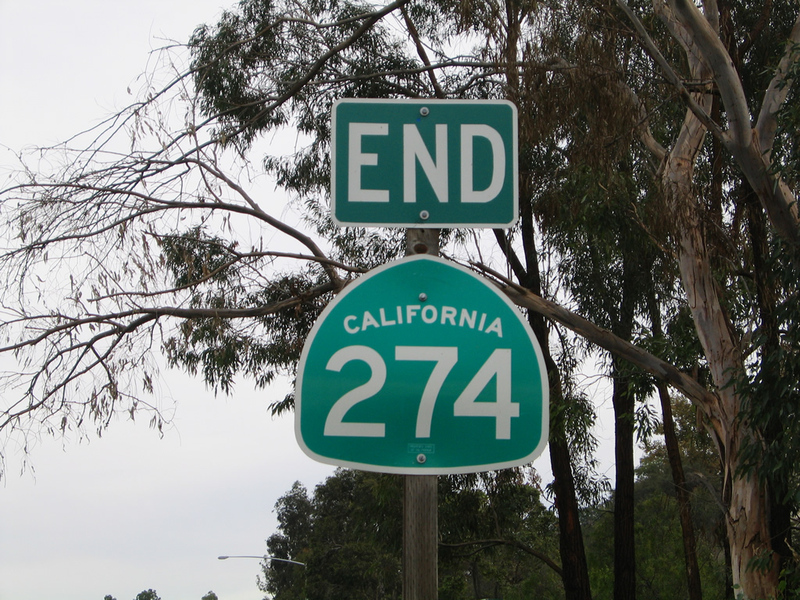 A final reassurance shield for California 274 east was posted here until 2005. 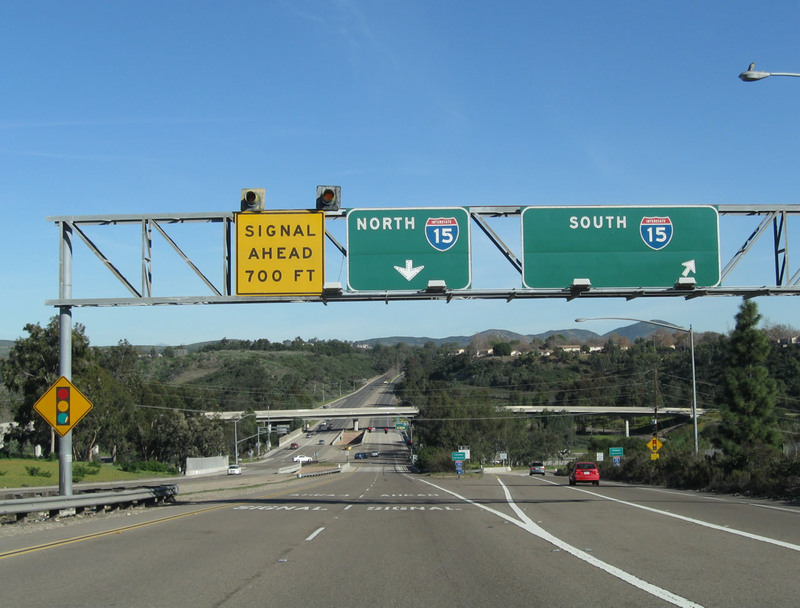 Stay right to connect to Interstate 15 south to Mission Valley, City Heights, and National City. Photos taken 01/14/11 and 11/05/04. 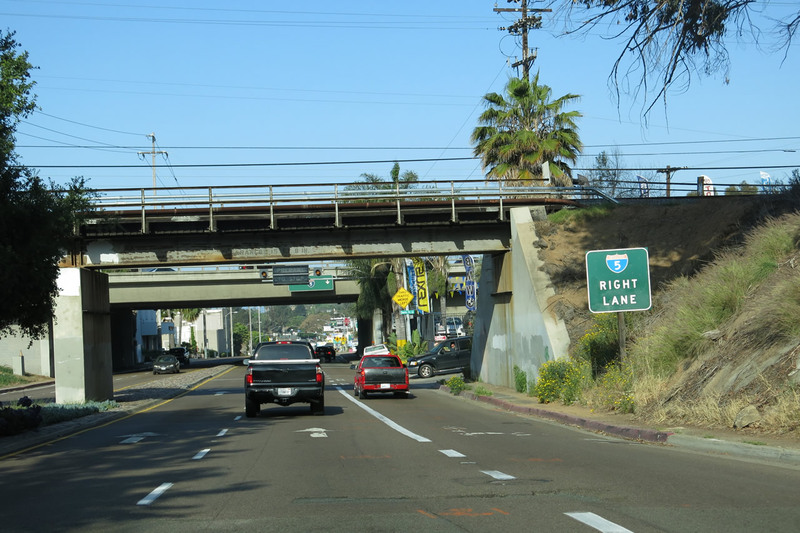 The right lane of Balboa Avenue (old California 274) east splits toward Interstate 15 south. This off-ramp is the one that was catastrophically damaged by a sinkhole in the winter of 1997-1998. 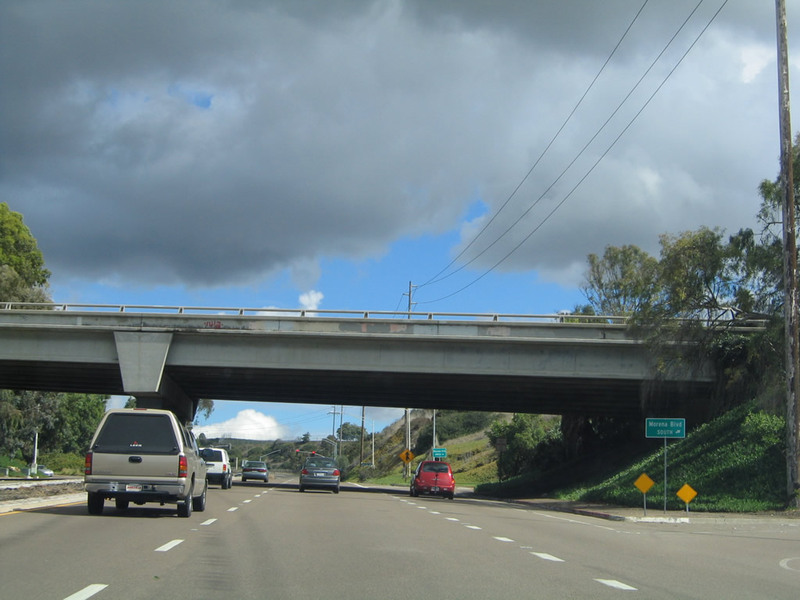 The voluminous El Nino rains of 1997 backed up a Caltrans storm drain, which in turn caused a sinkhole on the southwest quadrant of this interchange, causing sections of California 274 and ramps connecting it with Interstate 15 to collapse into the saturated ground. The sinkhole and road repair took over six months to complete. Photo taken 01/14/11. 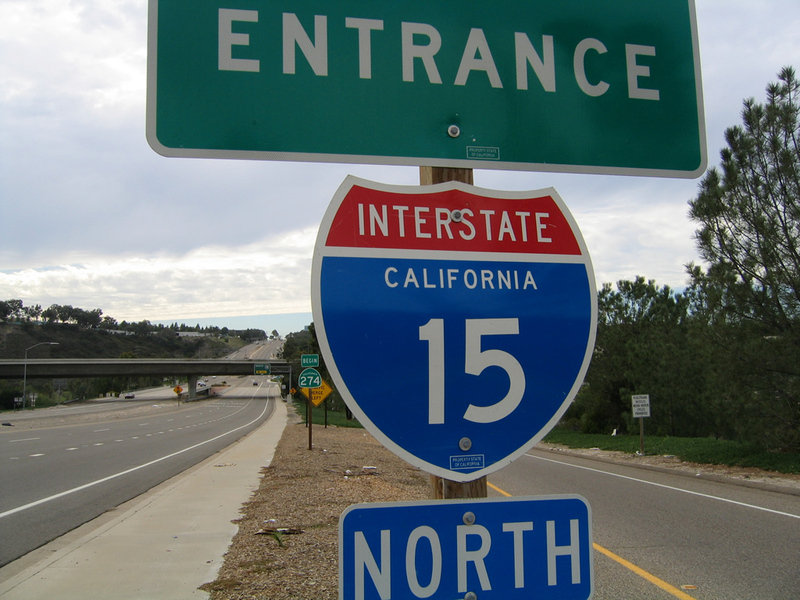 A freeway entrance shield is posted for Interstate 15 south. Photo taken 01/14/11. 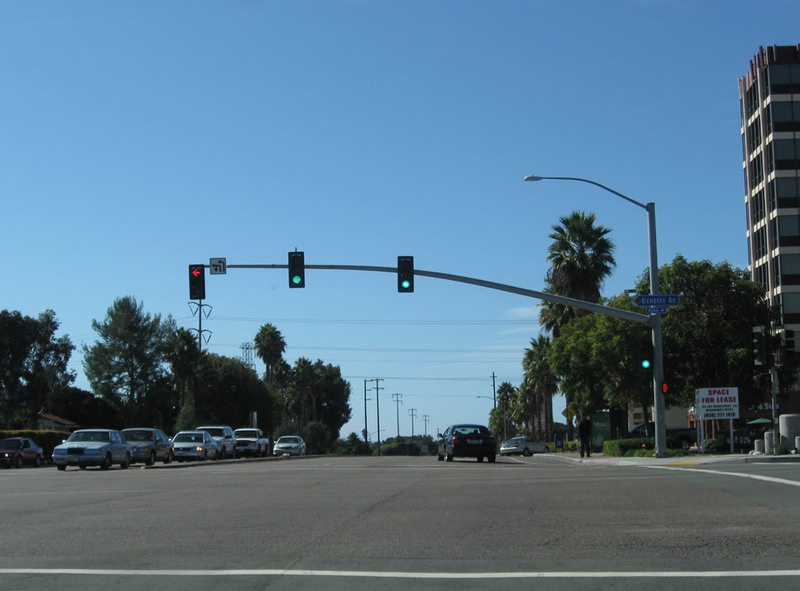 This traffic signal governs the flow of traffic from Interstate 15 south onto Balboa Avenue (old California 274). Photo taken 11/05/04. 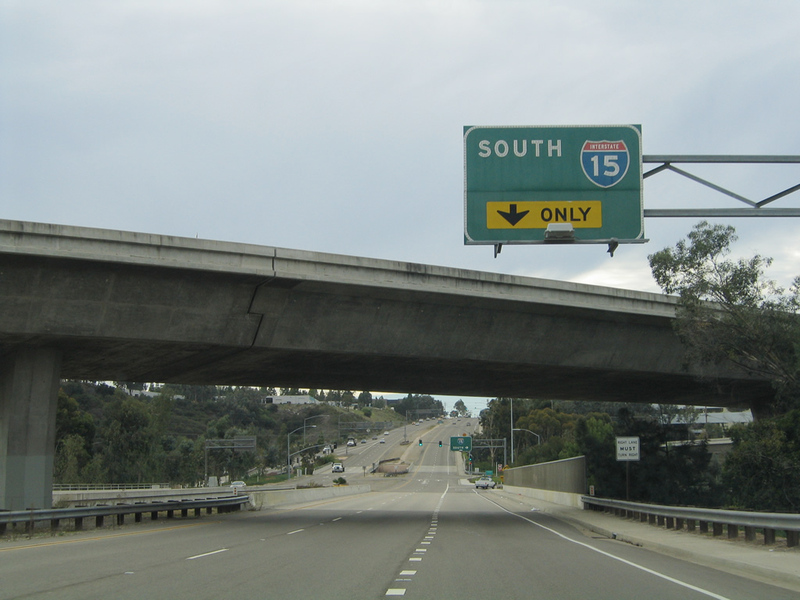 A flyover ramp carries traffic from Interstate 15 north to Balboa Avenue (California 274) west. Photo taken 01/14/11. 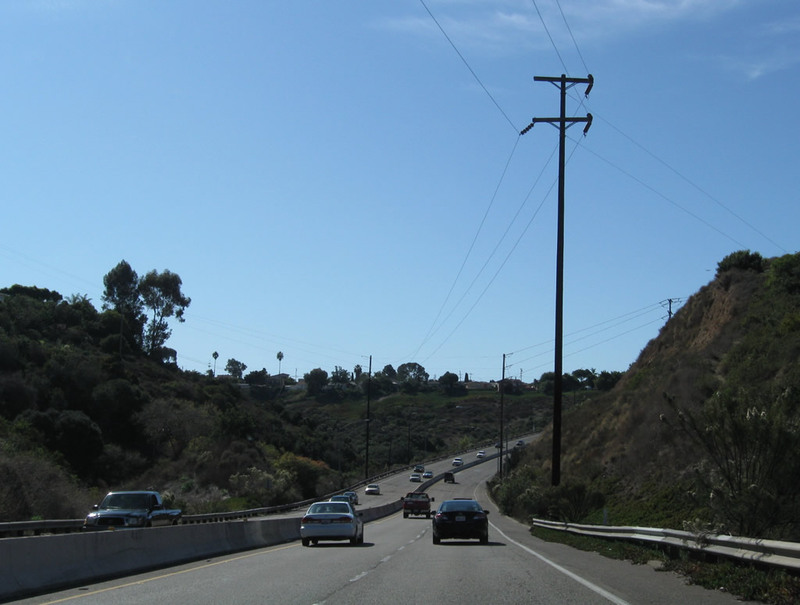 The next right connects Balboa Avenue (old California 274) east to Interstate 15 (Escondido Freeway) north. Photo taken 11/05/04. 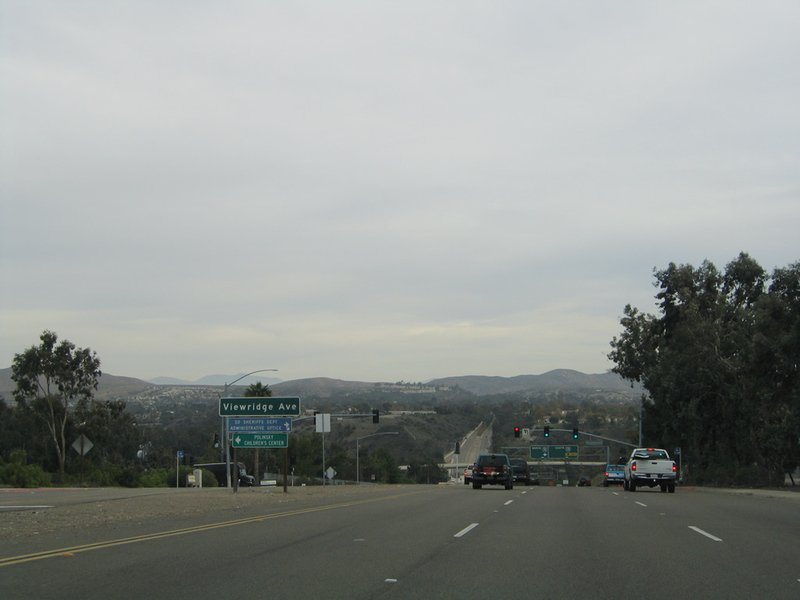 Eastbound Balboa Avenue (old California 274) meets the loop ramp to Interstate 15 north to Mira Mesa, Scripps Ranch, Rancho Bernardo, and Escondido. Photo taken 11/05/04. 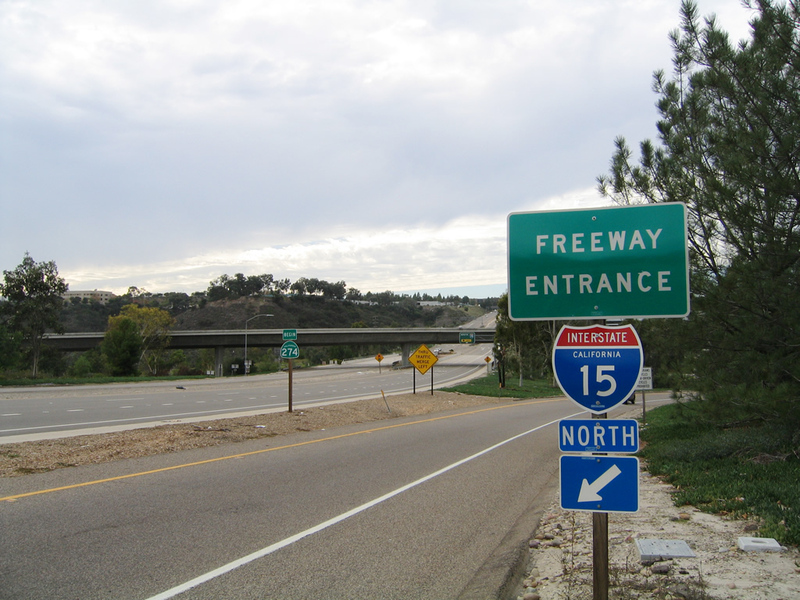 An Interstate 15 freeway entrance shield assembly is posted next to the on-ramp to Interstate 15 north. Photo taken 01/14/11. 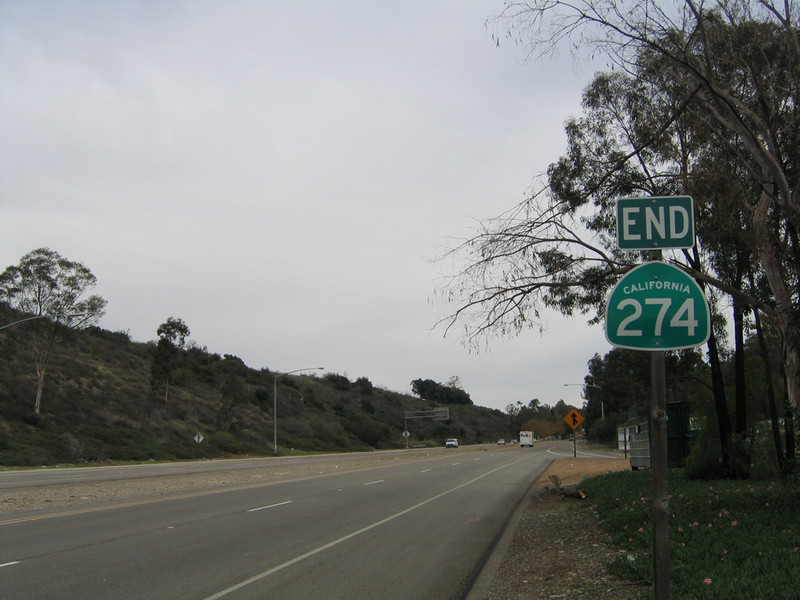 An end shield for California 274 east was previously posted after the Interstate 15 north transition ramp, but it&apos; gone now. 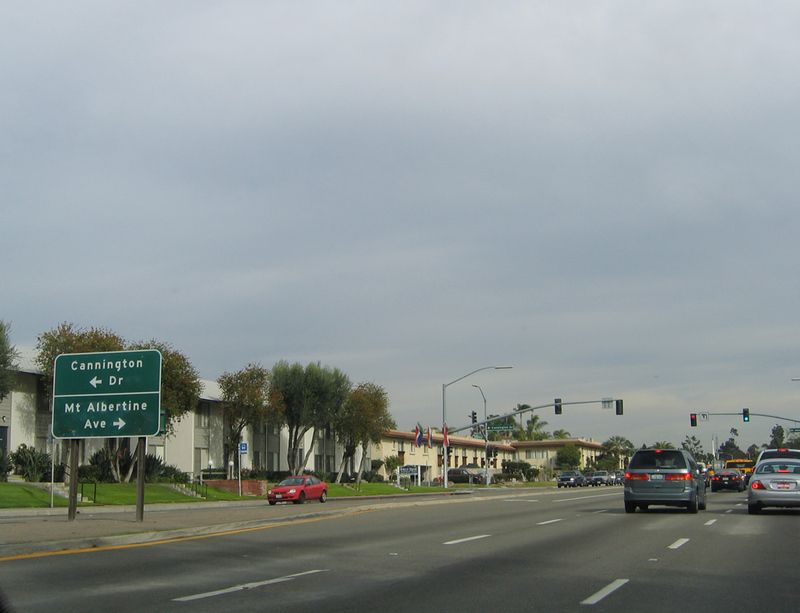 After this sign, Balboa Avenue transitions directly onto Tierrasanta Boulevard, which serves the community of Tierrasanta. Tierrasanta Boulevard is not a through route and thus does not serve through traffic. Photos taken 11/05/04. 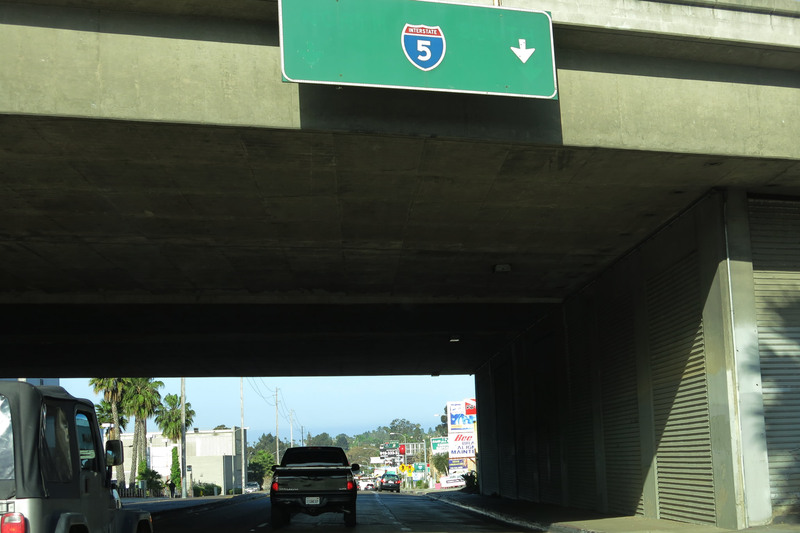 Traffic from Interstate 15 north merges onto eastbound Balboa Avenue, which now changes into Tierrasanta Boulevard. Photo taken 01/14/11. 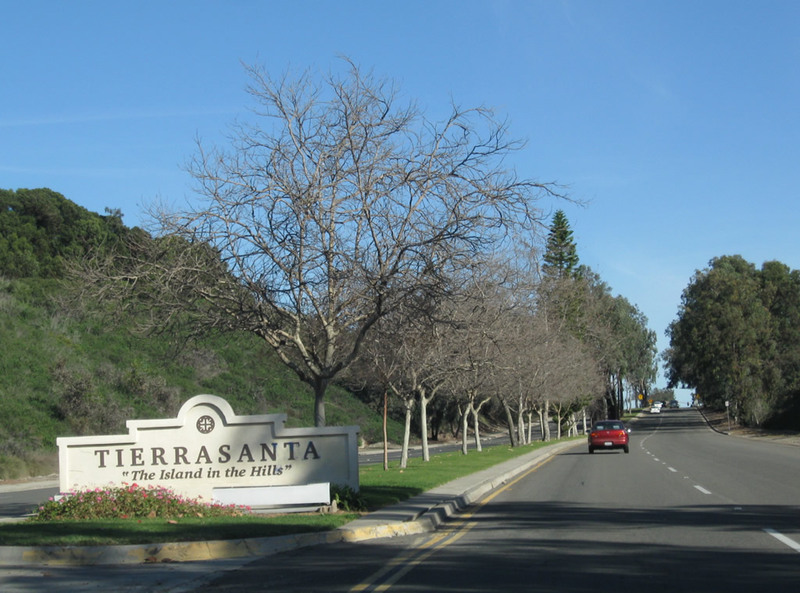 Tierrasanta is known as the "Island in the Hills"; it is a large residential community nestled between Interstate 15/Murphy Canyon on one side and Mission Trails Regional Park on the other. Photo taken 01/14/11. 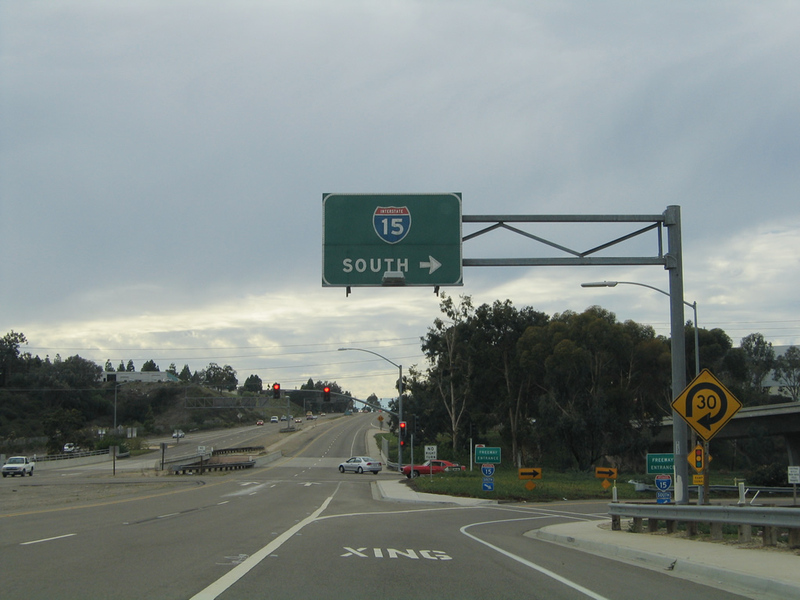 Westbound Tierrasanta Boulevard, which becomes Balboa Avenue (old California 274) at the Interstate 15 interchange. 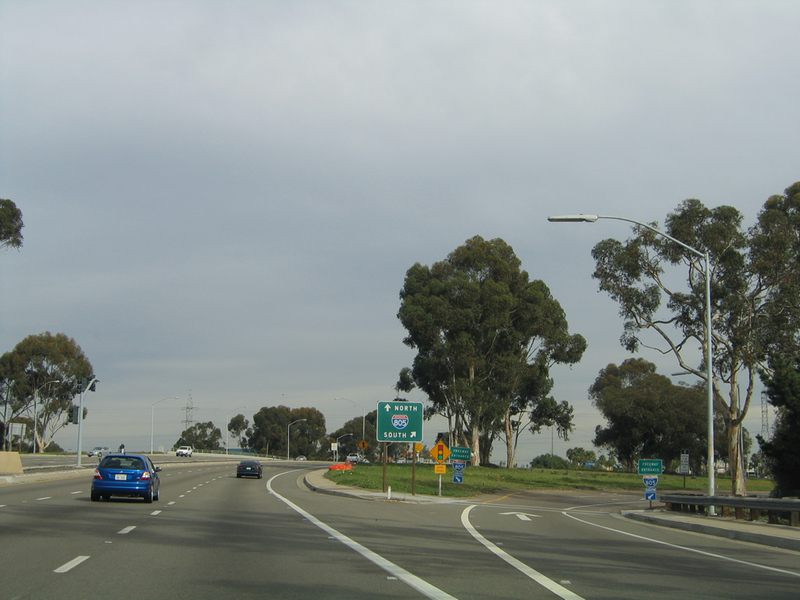 At this interchange, Balboa Avenue leaves Tierrasanta and enters Kearny Mesa. Photo taken 11/05/04. 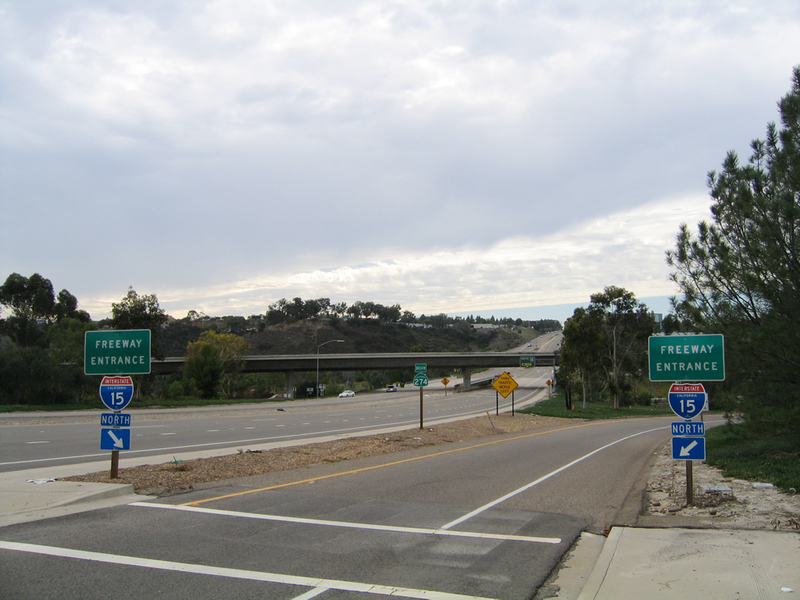 Now at the transition ramp to Interstate 15 (Escondido Freeway) north to Riverside, a pair of freeway entrance shield assemblies flank the ramp. Photos taken 11/05/04. 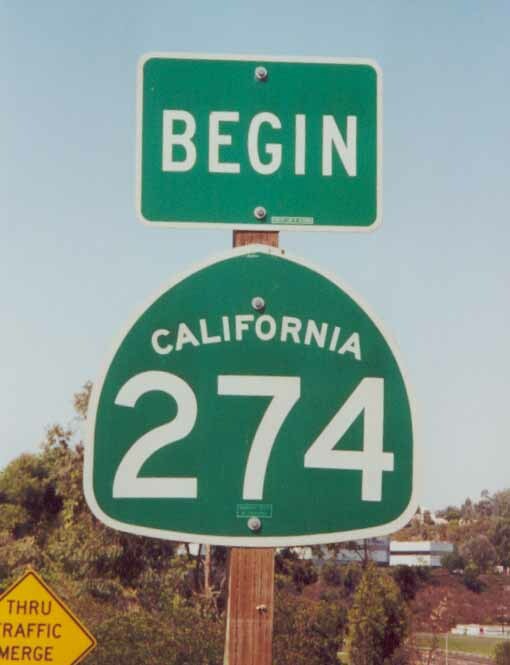 A rare begin shield was posted for California 274 for a brief period, from around 1999 until 2005. Photos taken 11/05/04. 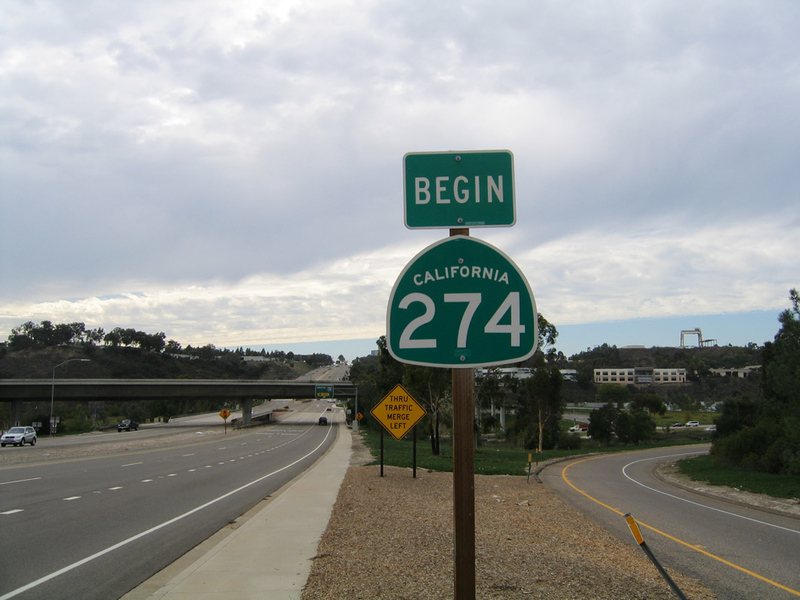 This begin California 274 shield assembly was located just east of the Interstate 15/California 274 interchange. This shield assembly was placed right around the same time that the city of San Diego took over ownership of this route, so it was only in the field for a short time ... the signs are now gone. Photos taken 09/30/00. The right lane of California 274 becomes exit only for Interstate 15 south. 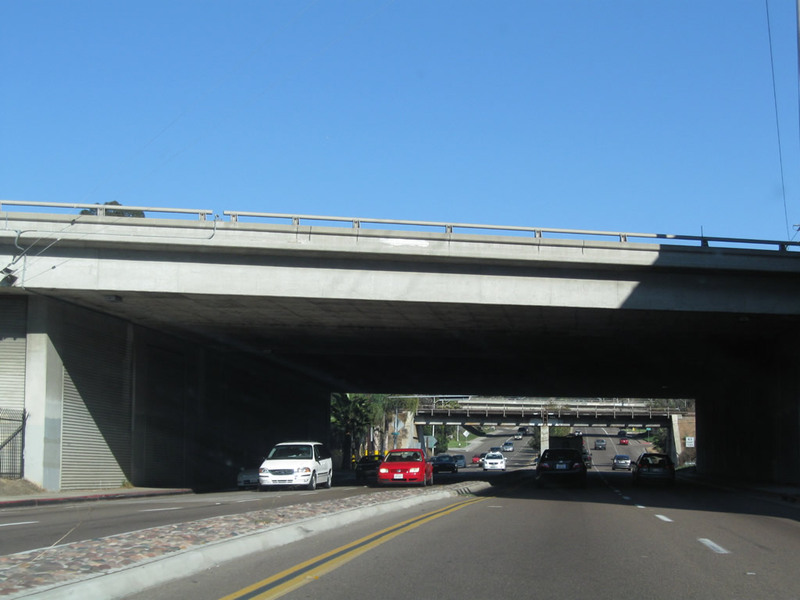 At this point, Balboa Avenue passes under the flyover ramp that connects Interstate 15 with Balboa Avenue west. This ramp was built partially with funds from General Dynamics, a large aerospace defense industry contractor that had large labor pools in the 1980s. 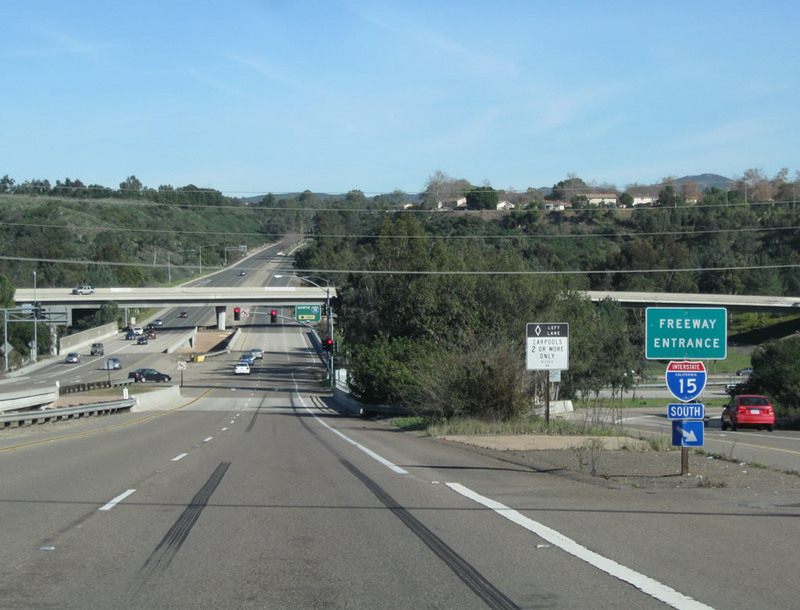 A large General Dynamics facility used to be located in Kearny Mesa, and commuters would use the connection from Interstate 15 to California 274 to get to work. Today, the General Dynamics facility is located where the San Diego Spectrum is located today. Photo taken 11/05/04. 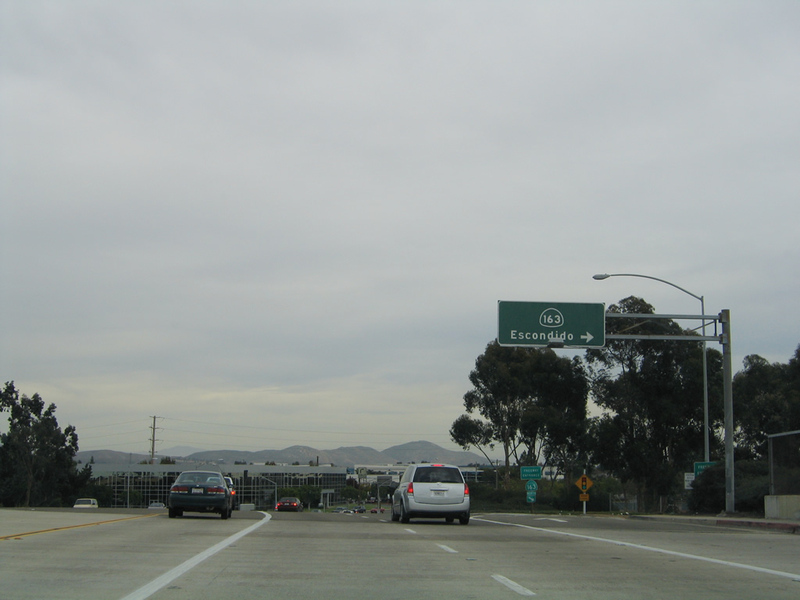 Westbound Balboa Avenue (old California 274) meets southbound Interstate 15 at this transition ramp. Photo taken 11/05/04. Freeway entrance shields flank the on-ramp from Balboa Avenue (old California 274) to Interstate 15 south. Photo taken 11/05/04. This was the first California 274 shield along westbound Balboa Avenue after the Interstate 15 interchange; it has since been removed. Photo taken 09/30/00. 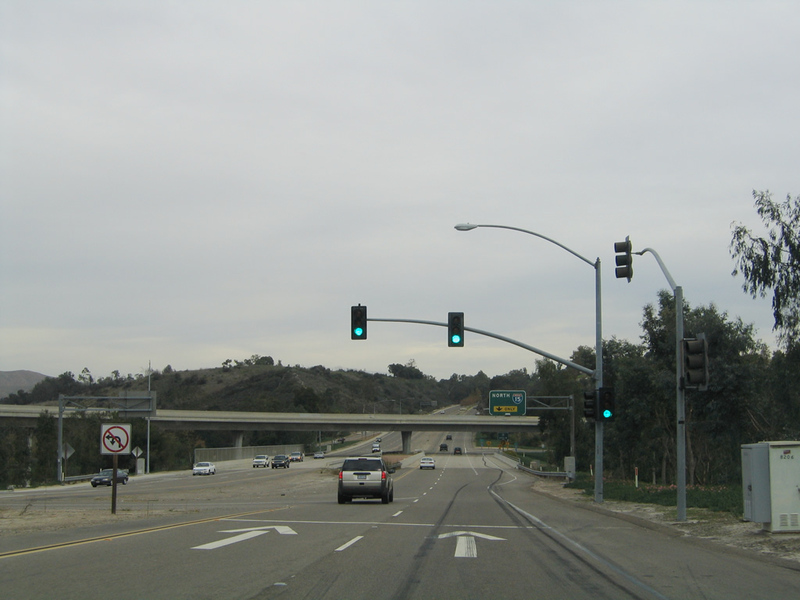 Now west of Interstate 805 and the signalized intersection with Cannington Drive and Mt. 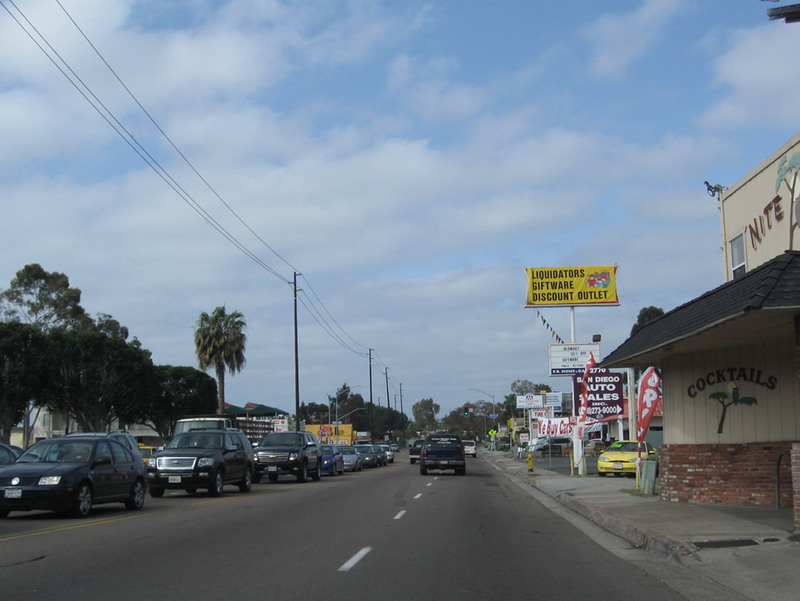 Albertine Avenue, westbound Balboa Avenue passes through some commercial areas through the community of Clairemont. Photo taken 11/13/11. Westbound Balboa Avenue meets Mt. Alifan Drive and Mt. Abernathy Avenue . 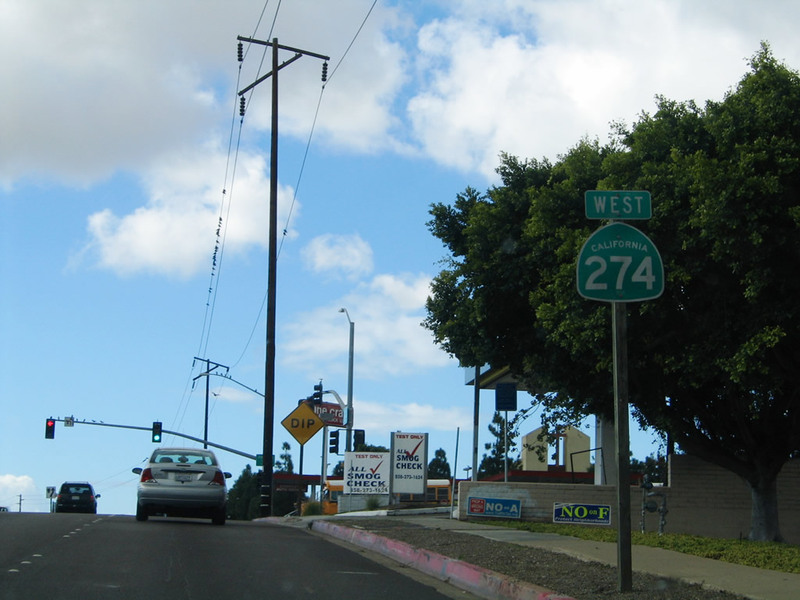 A remnant "WEST" banner remains on the traffic signal pole, but the California 274 shield that went with it is gone now. Photo taken 11/13/11. 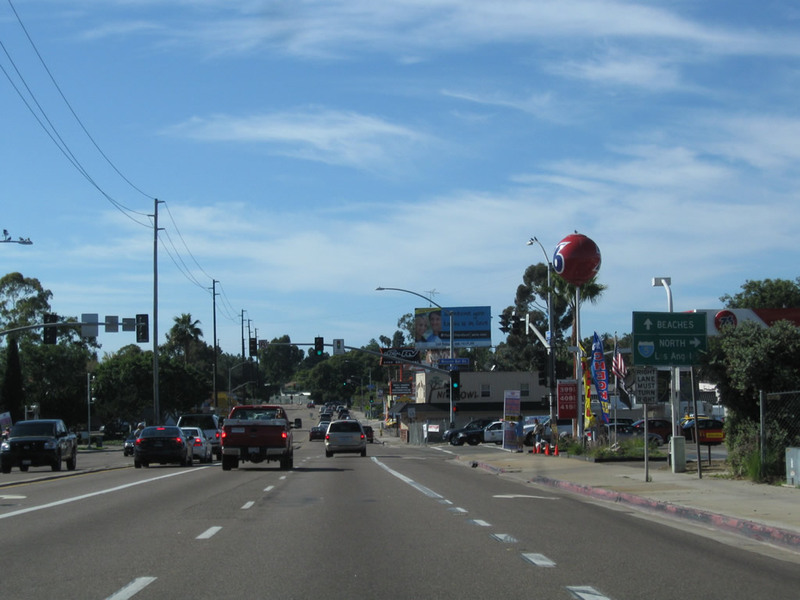 After passing by a major shopping area, westbound Balboa Avenue meets Genesee Avenue, which travels north to University City and Torrey Pines Mesa and southeast to Serra Mesa. Photo taken 11/13/11. 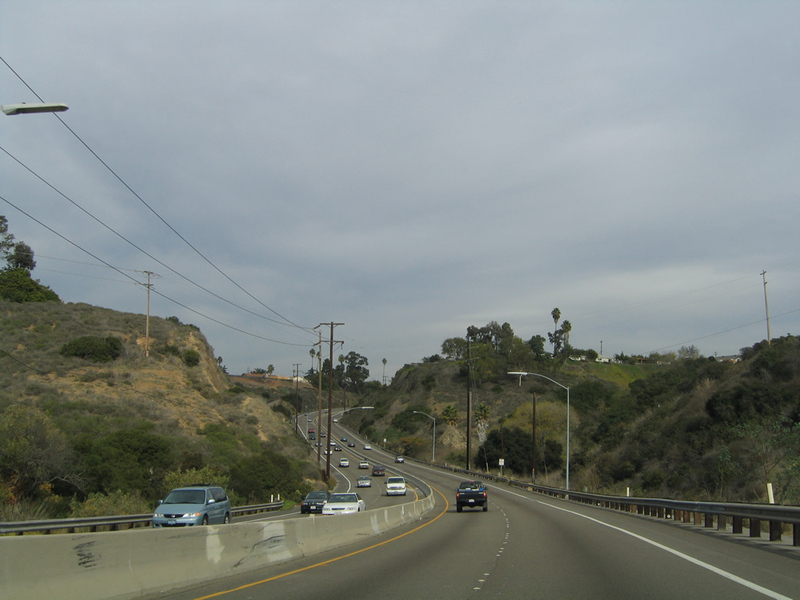 Between Genesee Avenue and Clairemont Drive, Balboa Avenue sees a brief expressway segment where the roadway drops into Tecolote Canyon, then climbs back out of it. Photo taken 11/13/11. 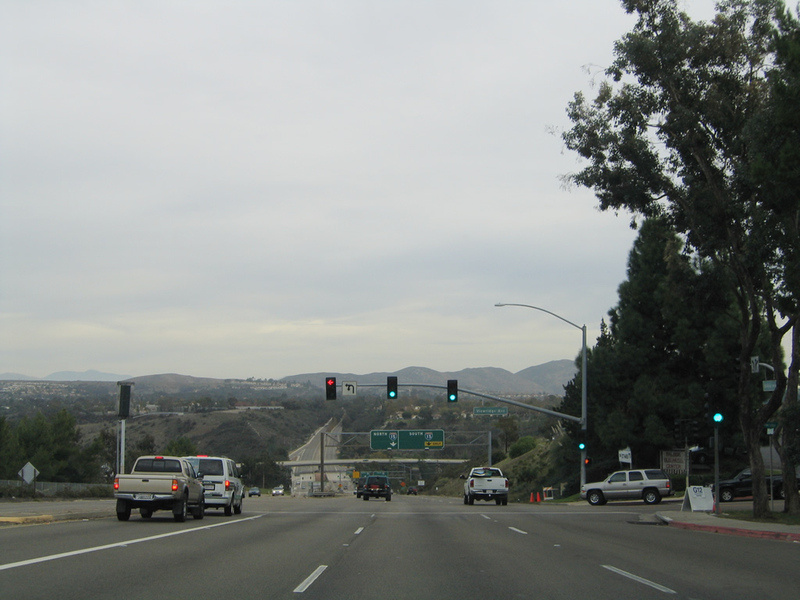 Near the rim of Tecolote Canyon, a California 274 west reassurance shield used to be posted here, along westbound Balboa Avenue prior to the Clairemont Drive signalized intersection. This shield is now gone. Photo taken 10/28/04. 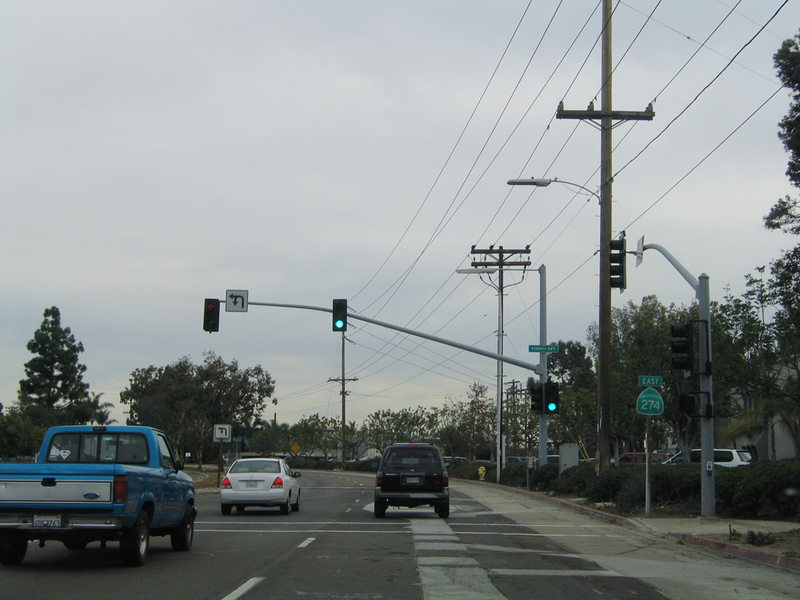 Westbound Balboa Avenue meets Clairemont Drive at this signalized intersection. Photo taken 11/13/11. Balboa Avenue descends from Clairemont Drive into Rose Canyon, where it will meet Interstate 5. Photo taken 11/13/11. 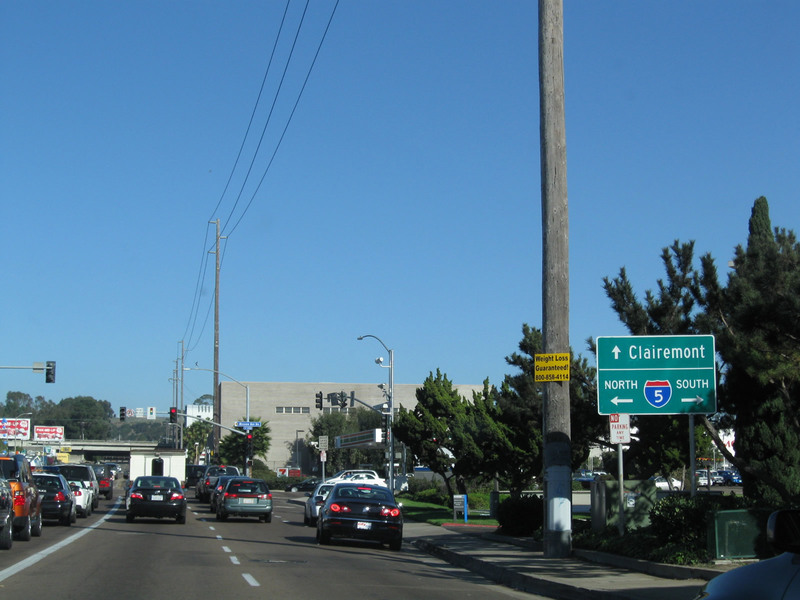 Westbound Balboa Avenue (old California 274) descends from Clairemont toward Pacific Beach after the Clairemont Drive intersection. A jersey barrier separates the two directions of traffic on this segment, which is comparable to an expressway. 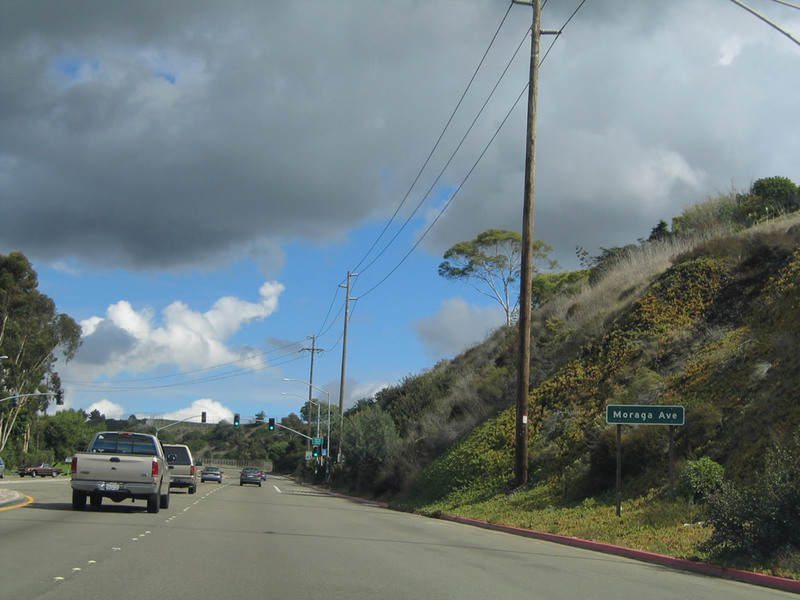 Toward the bottom of the hill is the signalized intersection with Moraga Avenue. 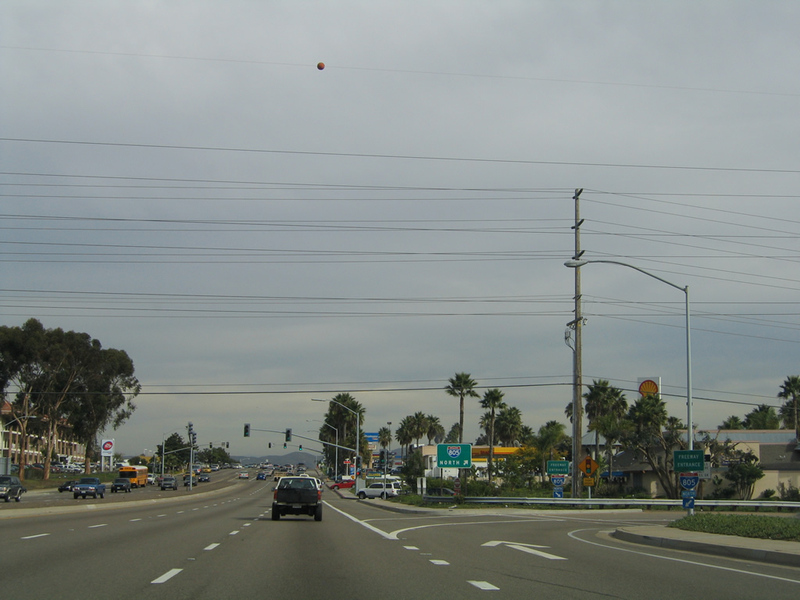 Note that Botts Dots were in use in 2004, but they were gone by 2011, consistent with Caltrans vs. City of San Diego roadway marking standards. Photos taken 11/13/11 and 10/28/04. A right turn here connects westbound Balboa Avenue (old California 274) with Balboa Terrace, which provides residential access on the north side of the route. Photo taken 10/28/04. Westbound Balboa Avenue meets Moraga Avenue at this signalized intersection. Photo taken 11/13/11. 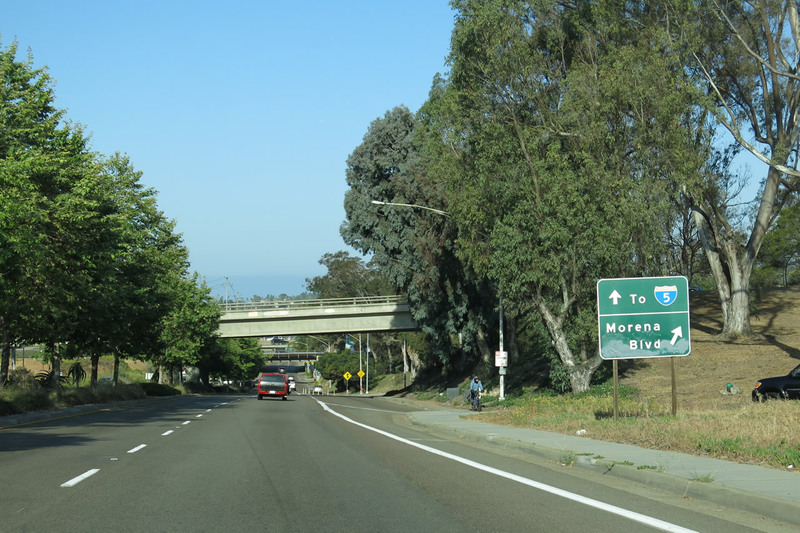 After the Moraga Avenue intersection, the next exit is the interchange connection to Morena Boulevard. 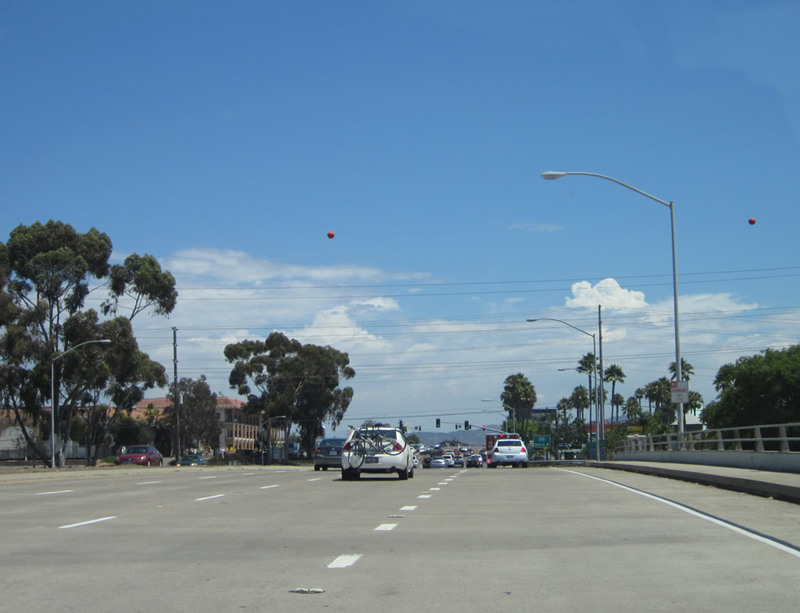 At this point, the oldest alignment of Historic U.S. 101 turns from Morena Boulevard onto westbound Balboa Avenue/Garnet Avenue. 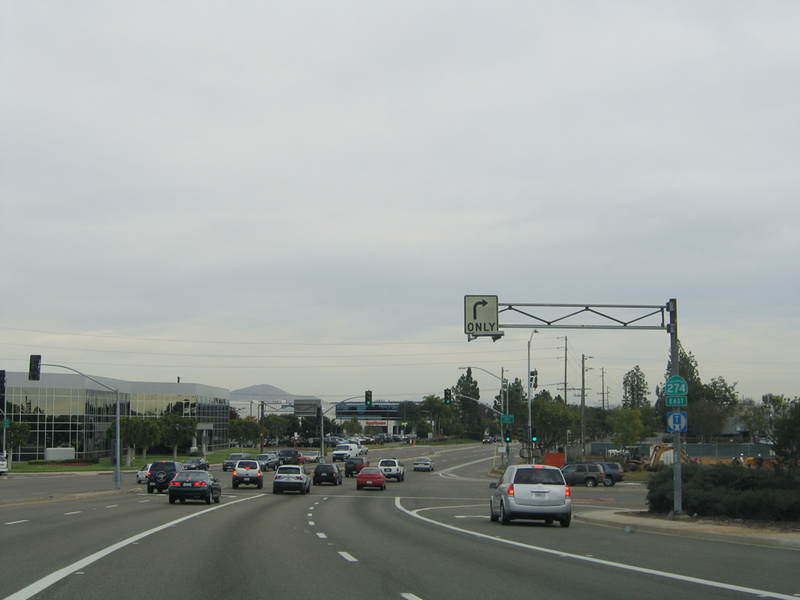 A roadside sign points the right turn to Morena Boulevard north/south and the continuation of Balboa Avenue to connect to Interstate 5. Photo taken 04/19/13. Balboa Avenue passes under Morena Boulevard. 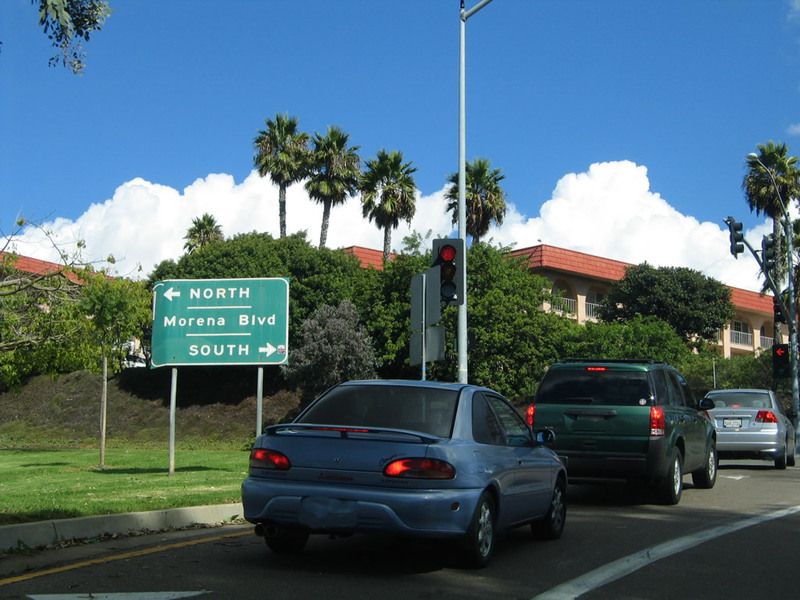 The right lane transitions onto a loop ramp that connects to Morena Boulevard north/south. 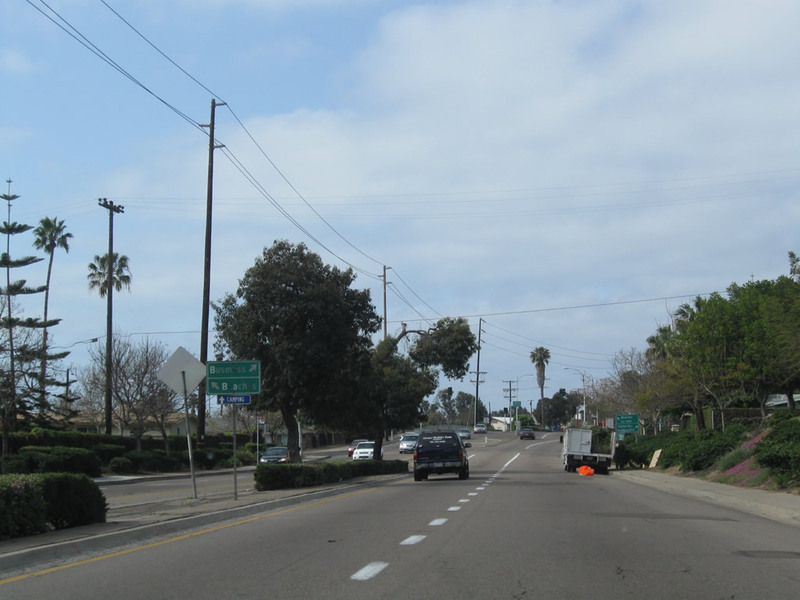 Ahead, Balboa Avenue transitions onto Garnet Avenue and becomes part of the original alignment of U.S. 101. 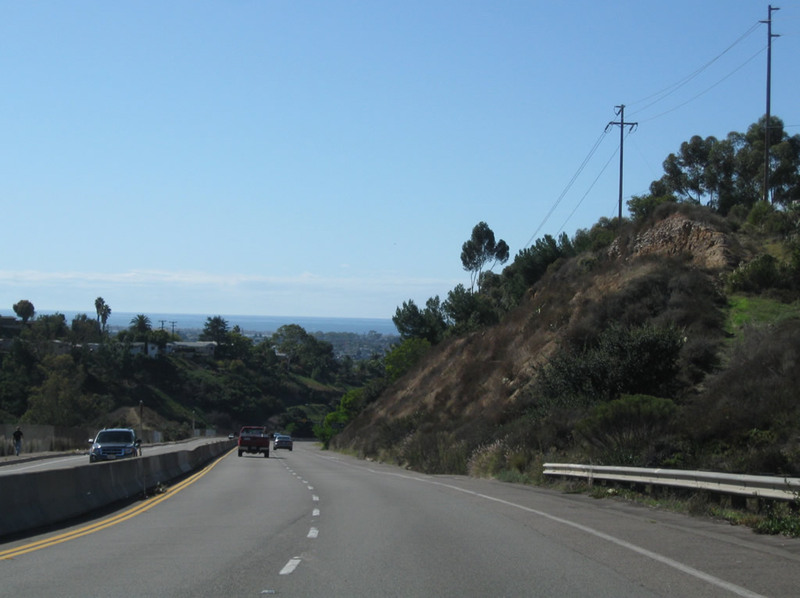 This historic highway, when originally routed through San Diego, followed Morena Boulevard, Garnet Avenue, Cass Street, Turquoise Street, and La Jolla Boulevard through Pacific Beach into La Jolla. Photo taken 04/19/13. 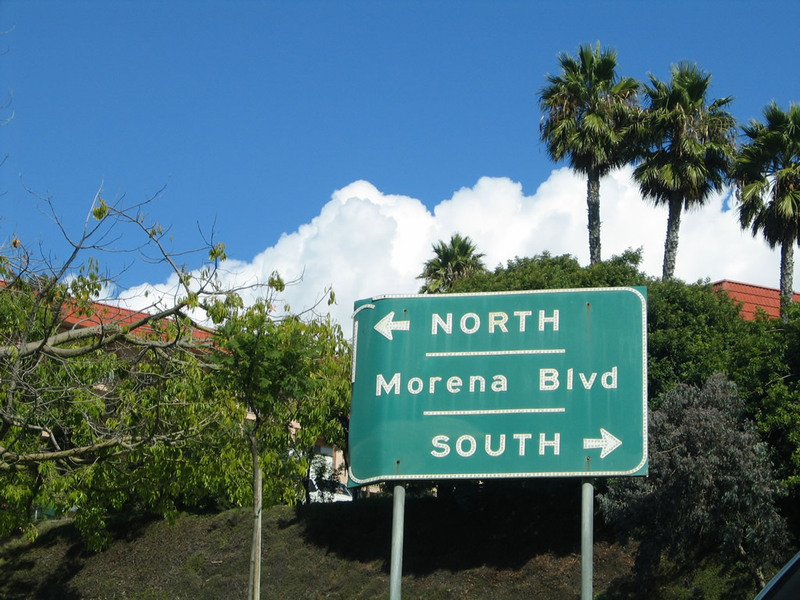 Now on the off-ramp from westbound Balboa Avenue to Morena Boulevard, motorists may turn left to follow Morena Boulevard north to Bay Ho and right (south) to Bay Park and the Morena district. Photos taken 10/28/04. 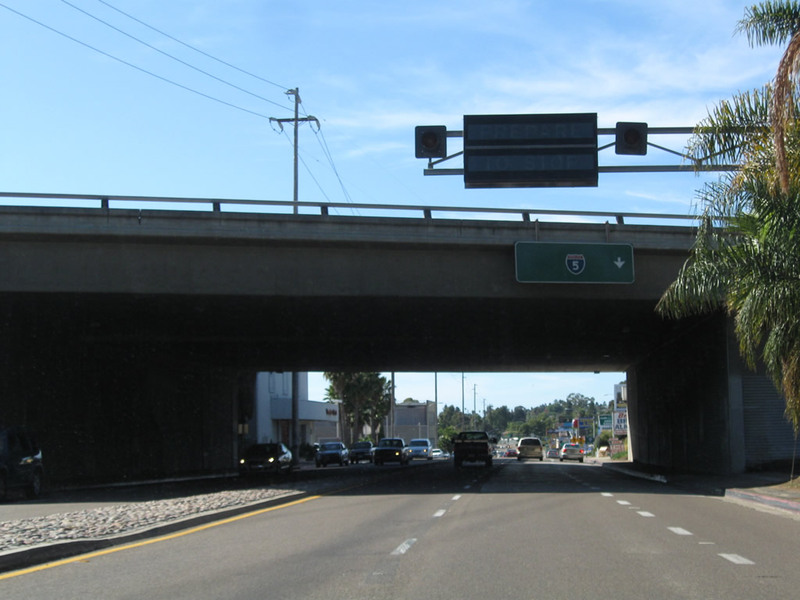 After the Morena Avenue interchange, Garnet (Balboa) Avenue passes under the railroad and next approaches Interstate 5. Merge to the right lane for Interstate 5 south and north. Photo taken 04/19/13. 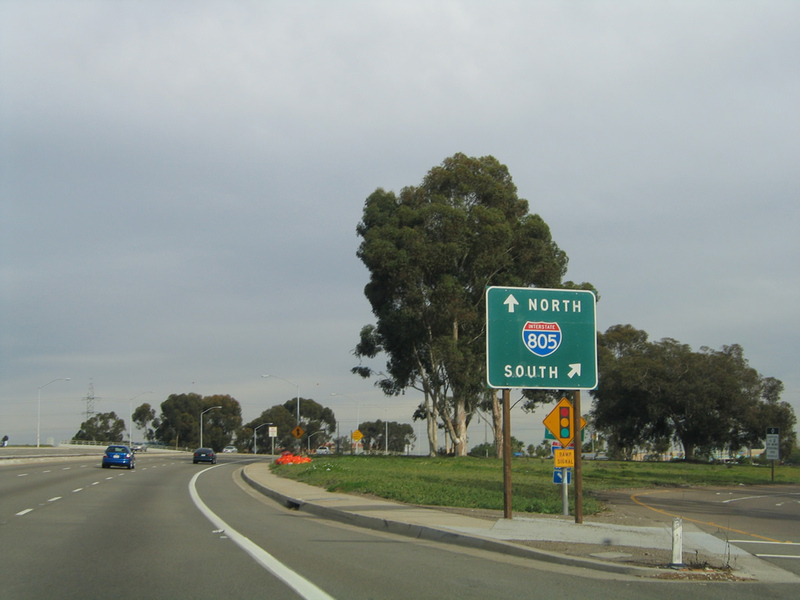 A new right lane becomes exit only for Interstate 5 south and Mission Bay Drive north to Interstate 5 north. The left two lanes continue west along Garnet Avenue. Watch for stopped or slow traffic, especially in the afternoon and evening hours. Photo taken 11/13/11. The right lane of Garnet Avenue west connects to Interstate 5 south and north. 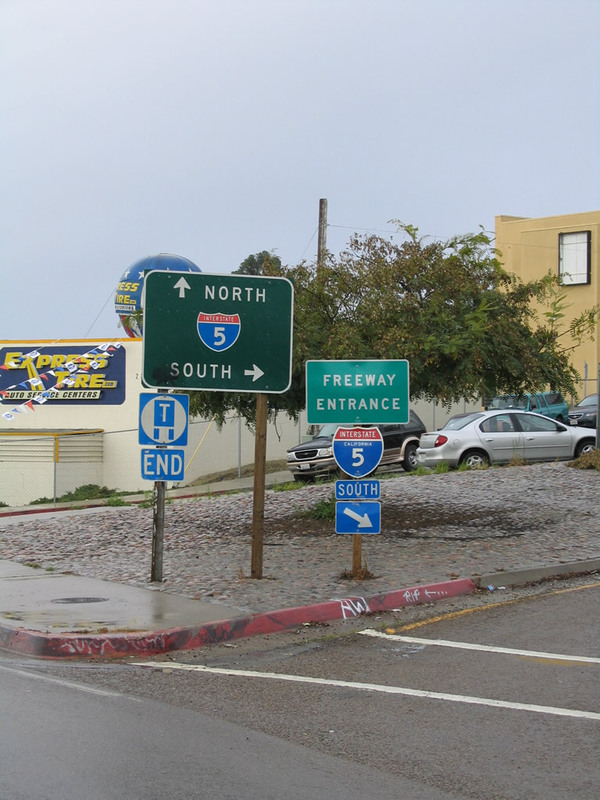 Note that this sign has been altered; it used to have all southbound Interstate 5 traffic in the right lane and northbound Interstate 5 traffic in the middle lane. Photo taken 04/19/13. Westbound Garnet (Balboa) Avenue meets the loop onto Interstate 5 south after passing under the freeway. Photo taken 05/02/13. 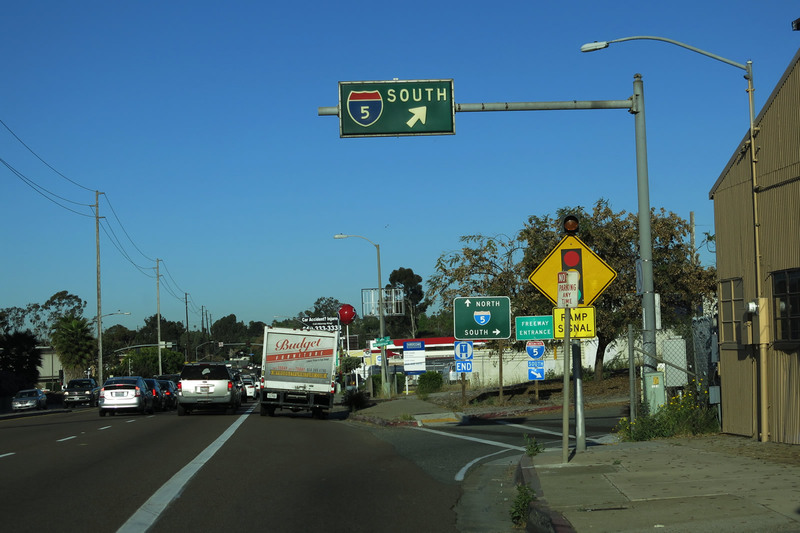 A right turn links links westbound Garnet (Balboa) Avenue with Interstate 5 (San Diego Freeway) south to downtown. Photo taken 02/19/05. 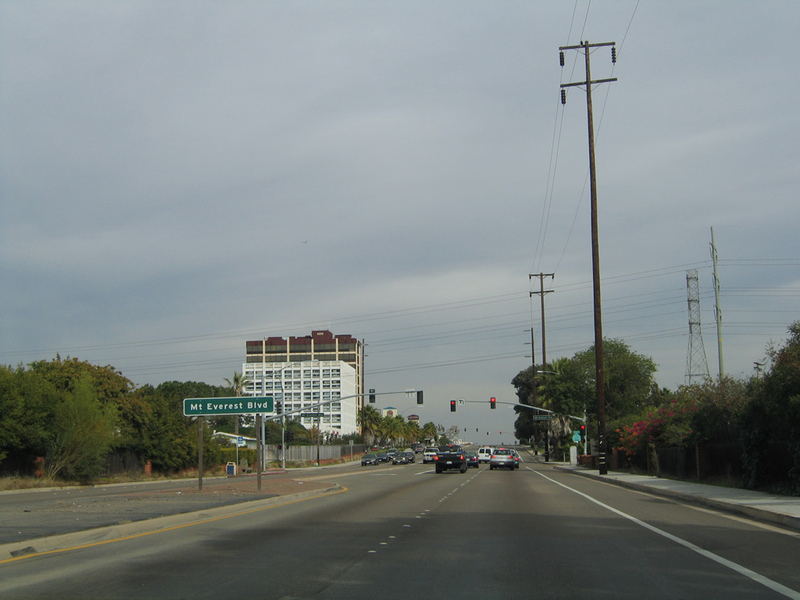 Westbound Garnet Avenue (Balboa Avenue) meets Business Loop I-5 (Mission Bay Drive); former California 274 used to end here. 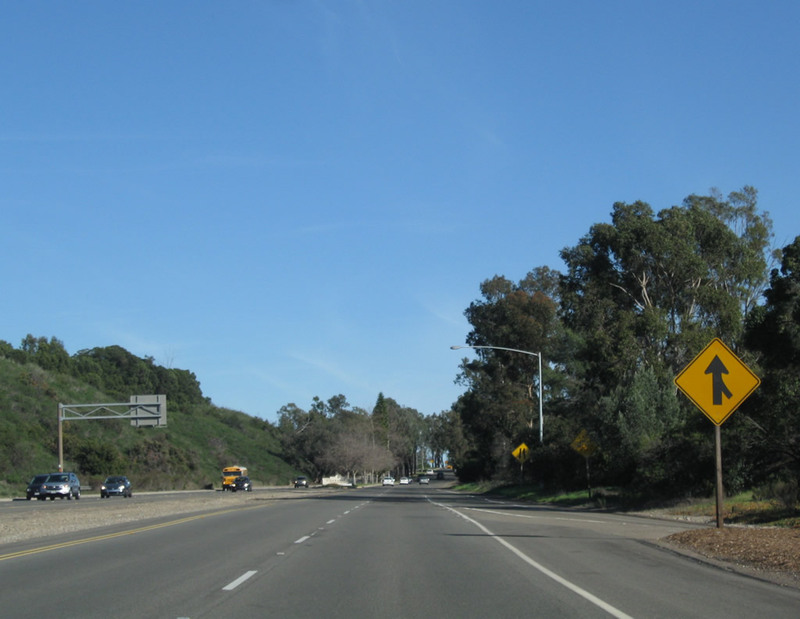 Turn left here for Mission Bay Drive south to Mission Bay Park and downtown San Diego or right for La Jolla, Carmel Valley, and points north via Interstate 5. 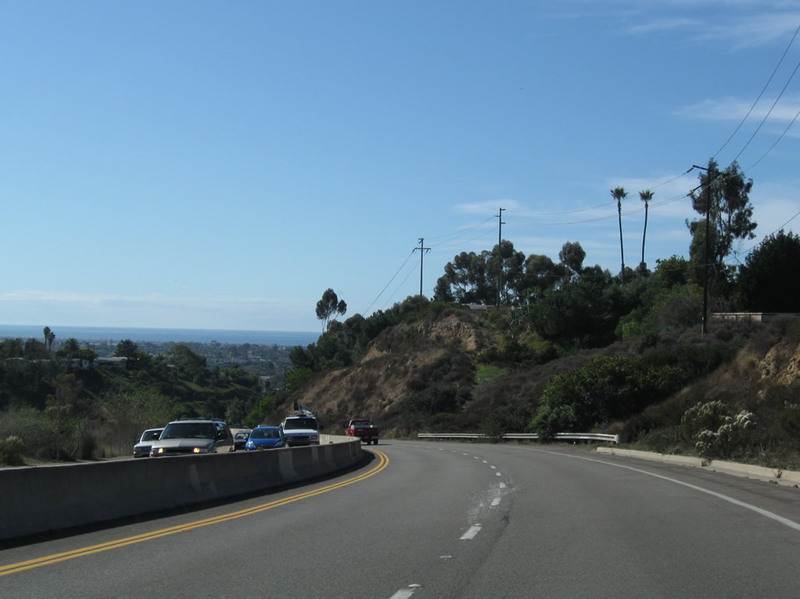 A later alignment of Historic U.S. 101 that used to pass through Rose Canyon en route to La Jolla turns north here. 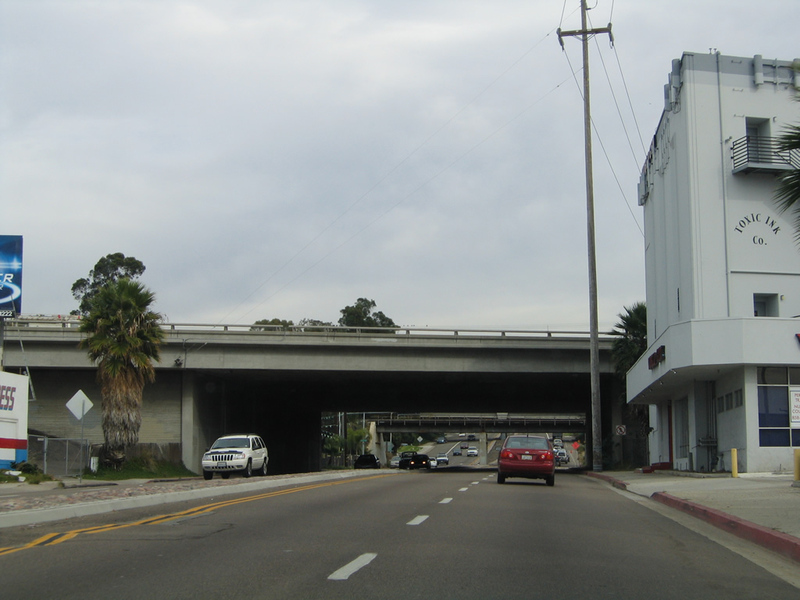 The original old U.S. 101 proceeds straight ahead on Garnet Avenue. Photo taken 11/13/11. 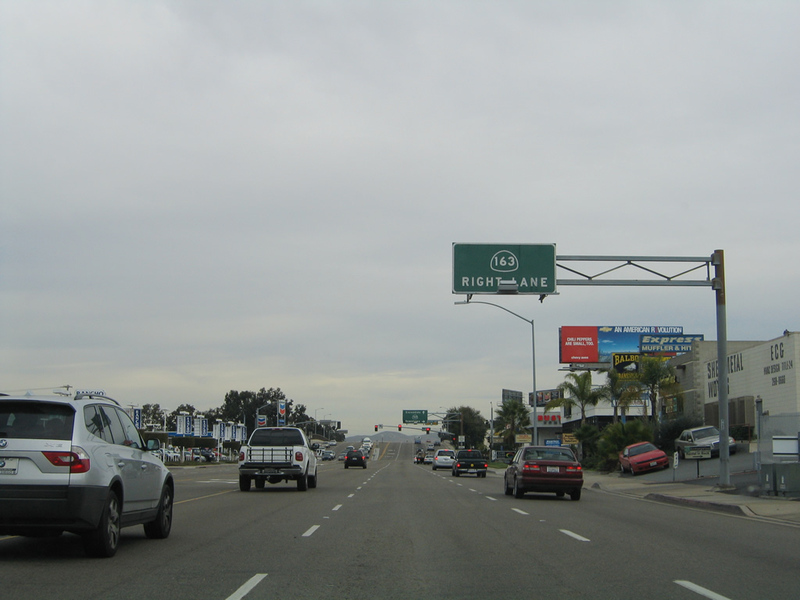 After the signalized intersection with Mission Bay Drive (Business Loop I-5 and Historic U.S. 101), westbound Garnet Avenue proceeds into Pacific Beach. Photo taken 03/25/10. Westbound Garnet Avenue meets Bond Street at this traffic signal. Photo taken 03/25/10. Garnet Avenue passes over Rose Creek. Photo taken 03/25/10. 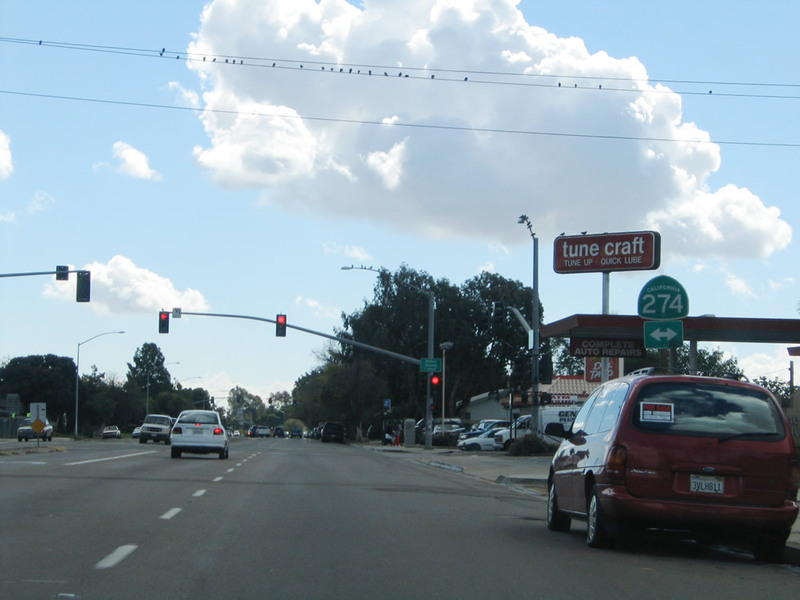 Westbound Garnet Avenue meets Soledad Mountain Road at this traffic signal. Photo taken 03/25/10. 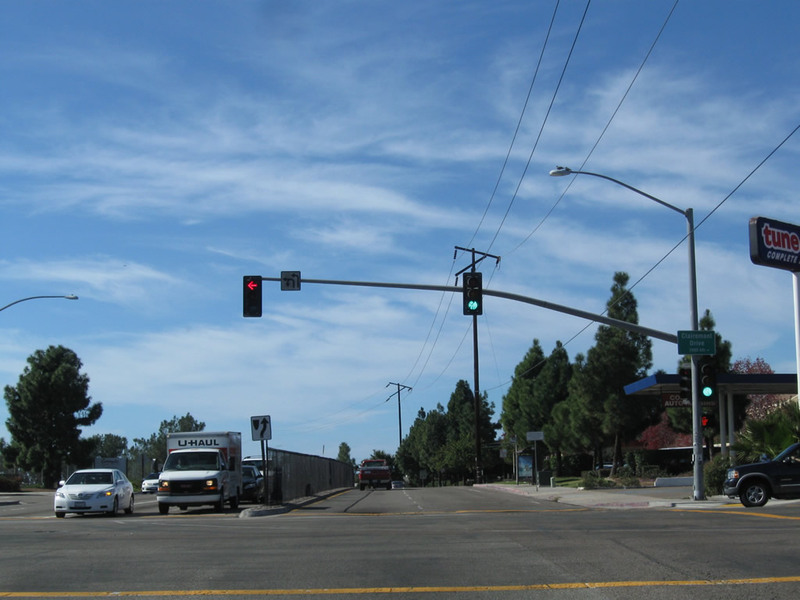 At the next traffic signal, Garnet Avenue and Balboa Avenue will split. 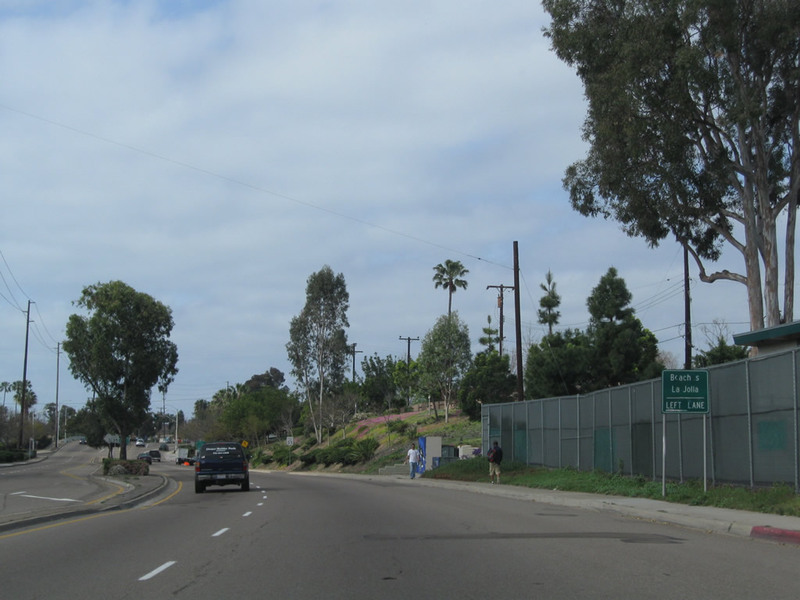 A series of roadside signs advises through traffic to La Jolla and the beaches to use Balboa Avenue. To the Pacific Beach Business District, use Garnet Avenue west. Photo taken 03/25/10. 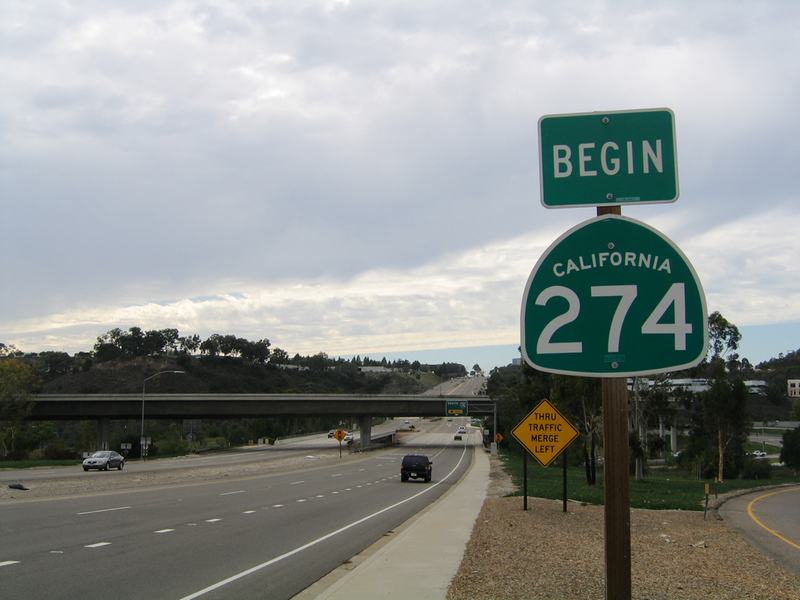 This trailblazer for California 274 was formerly posted along southbound Clairemont Drive; it was gone by 2006. Photo taken 10/28/04. Page Updated June 26, 2013.